My better half’s parents wanted to have dinner together last night so I thought of Kai’s Plato. 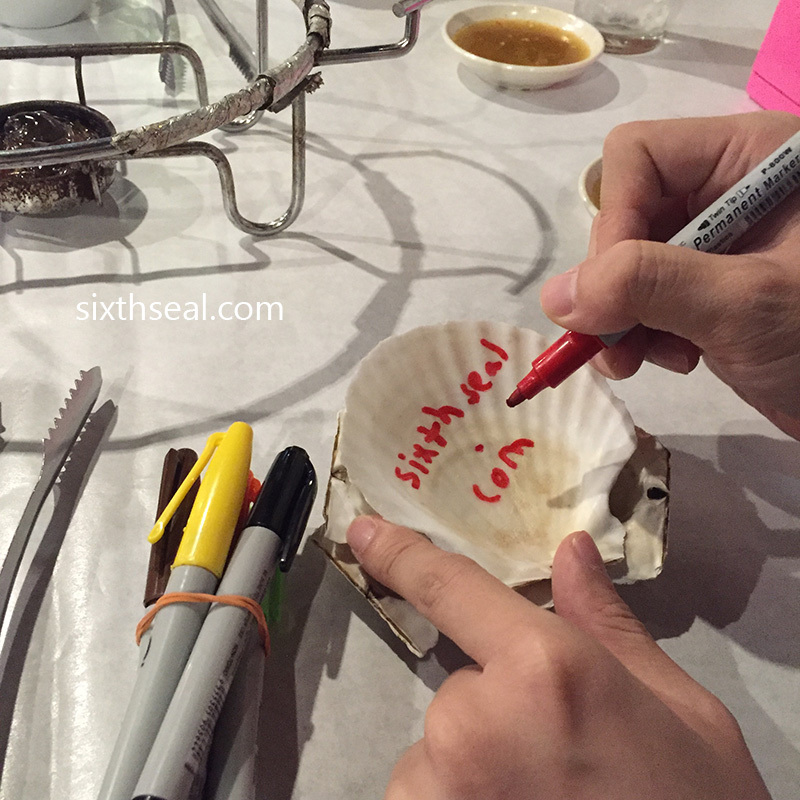 Kai’s Plato is a restaurant specializing in seafood that subscribes to a no utensils and plates policy. The lobster, prawns, crabs etc comes in a platter and you use the table and your fingers to eat everything. It’s a pretty cool experience. 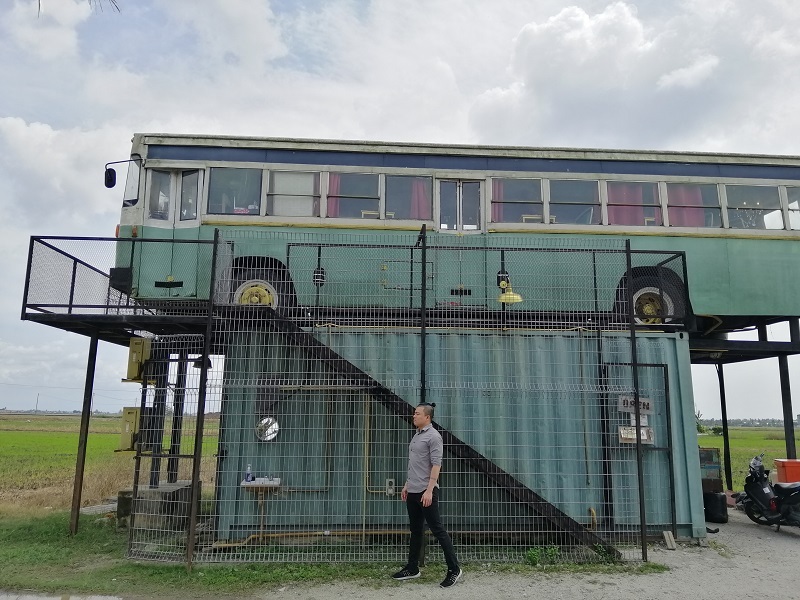 I had wanted to come when it first opened but the queues were prohibitive. 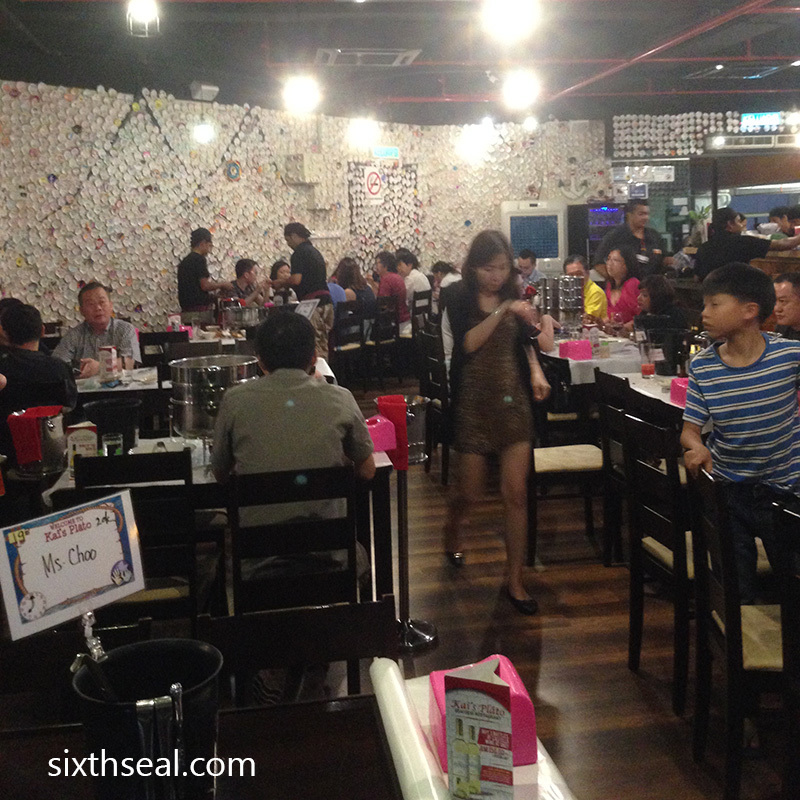 It’s still quite packed but you’ll be able to get in with a reservation. 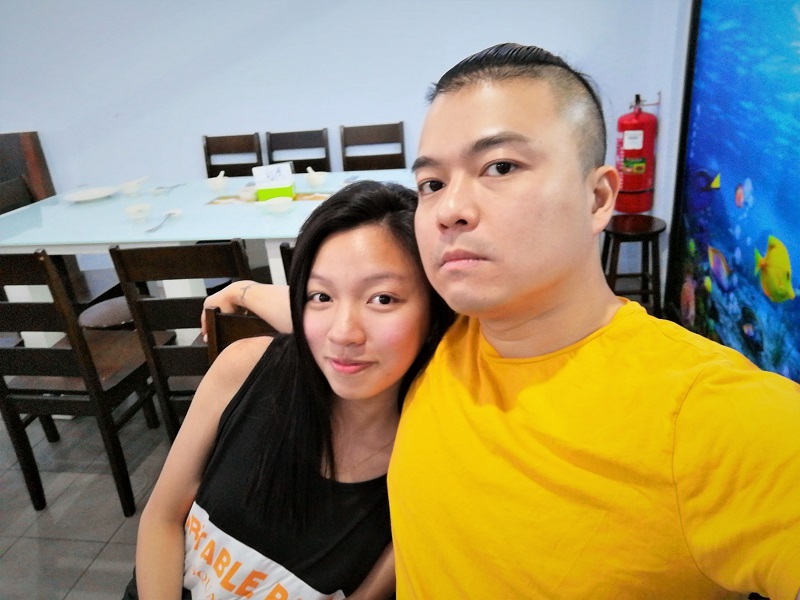 I booked a table for 4 pax at Kai’s Plato for 6:30 pm. There is only 1 menu item here. 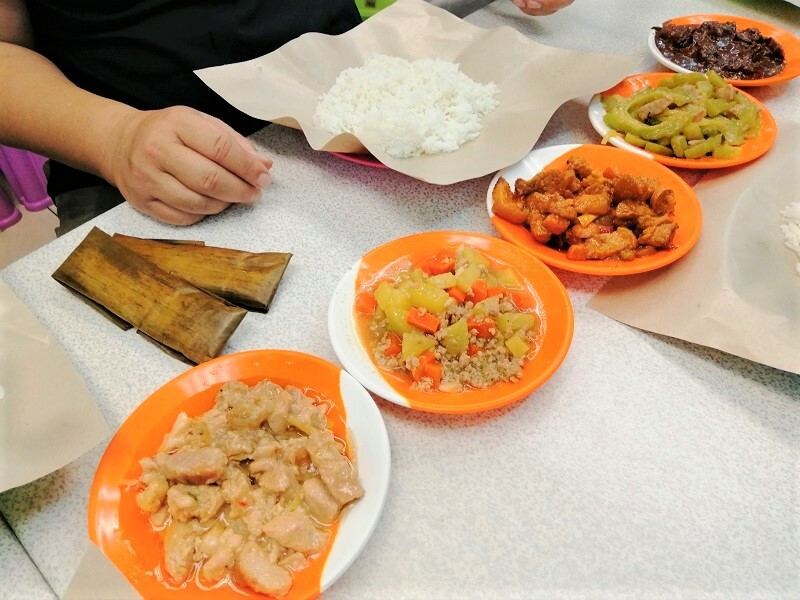 The meal is standardized and goes according to the number of people. 2 diners will be served with a 3-tier platter while 4 pax has a 4-tier platter. You get shells to draw with from the server. These will be mounted on the walls with your customized message – the walls of Kai’s Plato is filled with these. 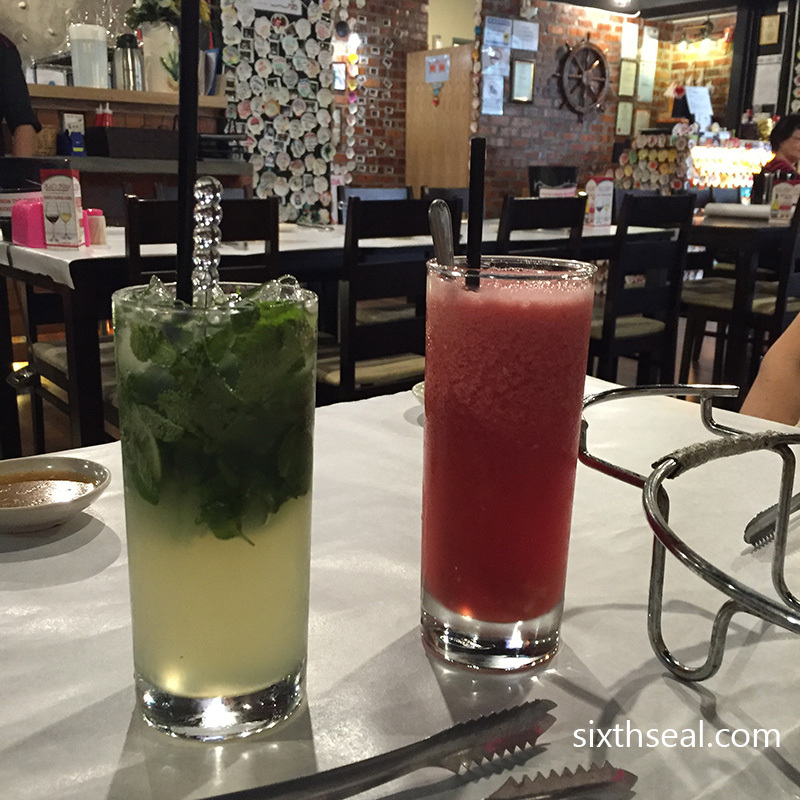 I ordered a Virgin Mojito (RM 8.90) while my dear had the Watermelon Lychee (RM 8.90). These two drinks are the house specials. 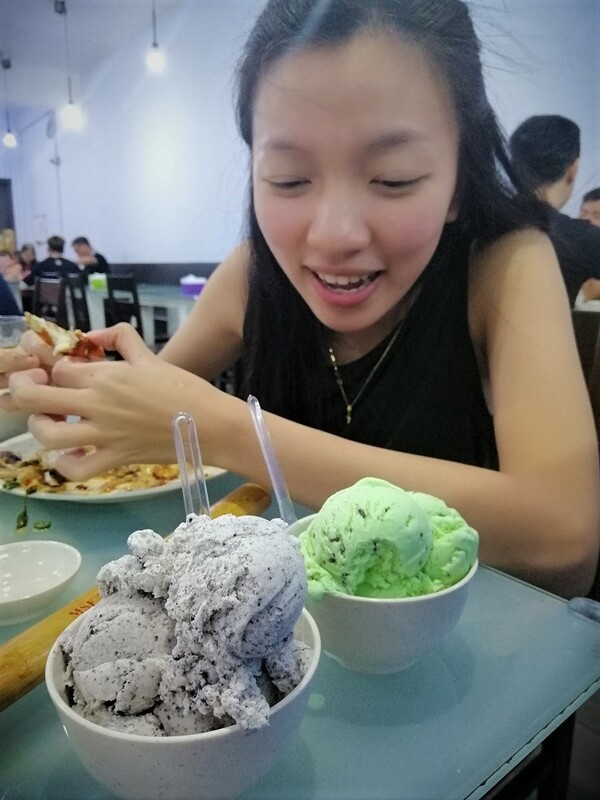 I liked the Watermelon Lychee, it’s very refreshing. The mojito was decent too, they don’t skip on the mint leaves here. It takes up a full half of the glass! Our 4-layer platter came and was mounted on the jelly flame source. This is the first tier in the platter. 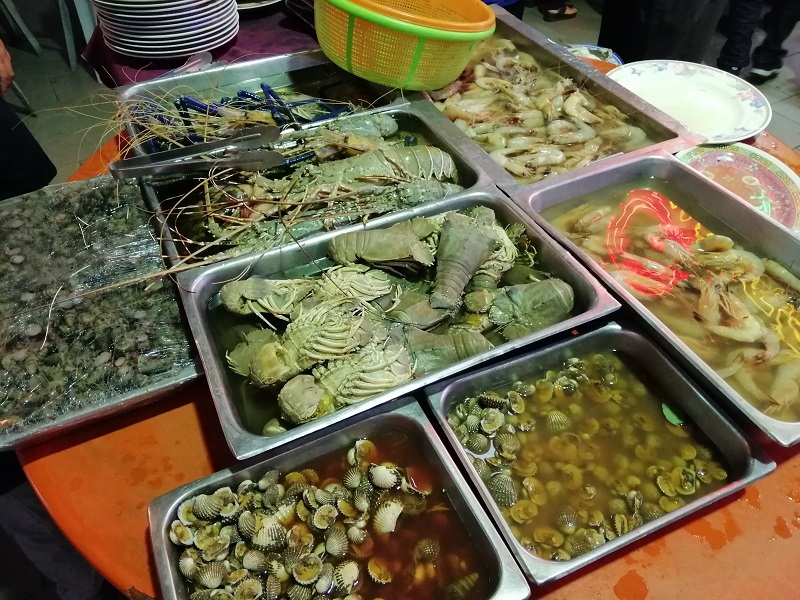 There are 11 types of seafood in total here. I particularly liked the sea snails. It’s musky and sandy. Yum! The scallops are served with chopped ginger and spring onions. The oysters are topped with cheese and it’s pretty awesome. 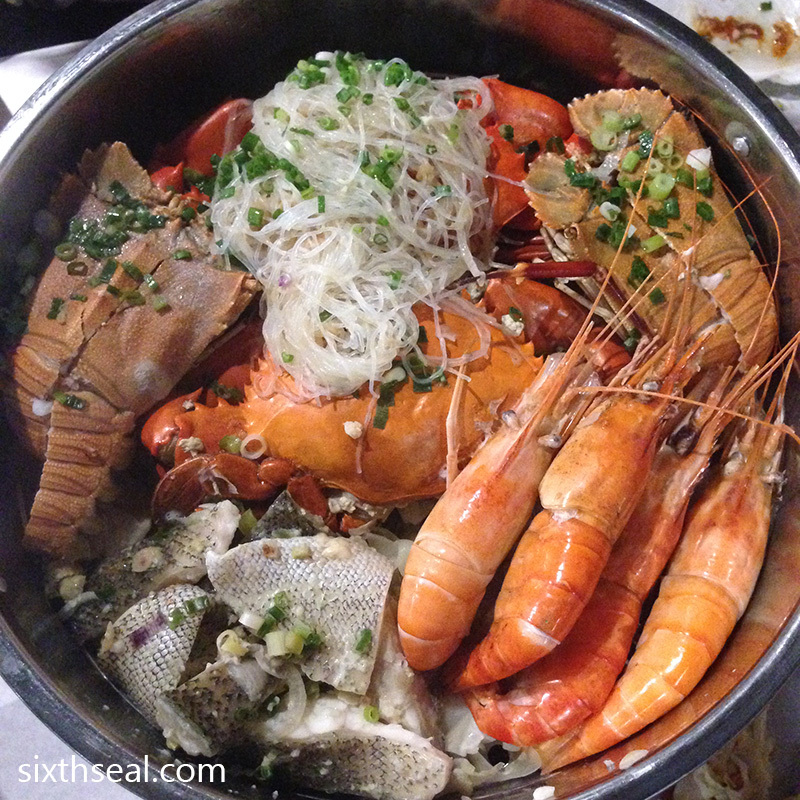 The second tier is filled with prawns, clams, mussels, bamboo clams and octopus. There is another type of clam called arc shell so there’s actually 3 types of clams in this layer. The bottom is lined with cabbage and the vegetables are edible. I preferred the broccoli from the first layer though. The third tier is the best one! 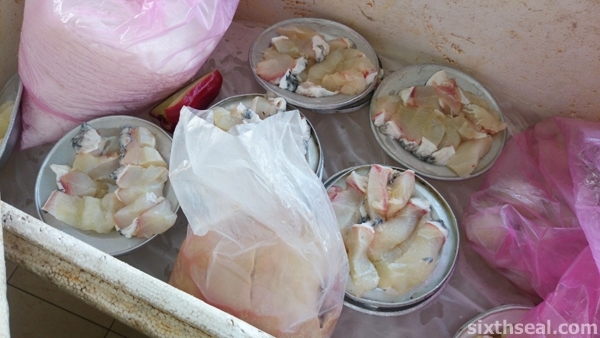 It contains the most premium ingredients – slipper lobsters, crabs, huge big head prawns, and grouper fish slices. I love the monster big head prawns. The brains are bigger than the size of my thumb when extracted! The mud crabs are super delicious too. 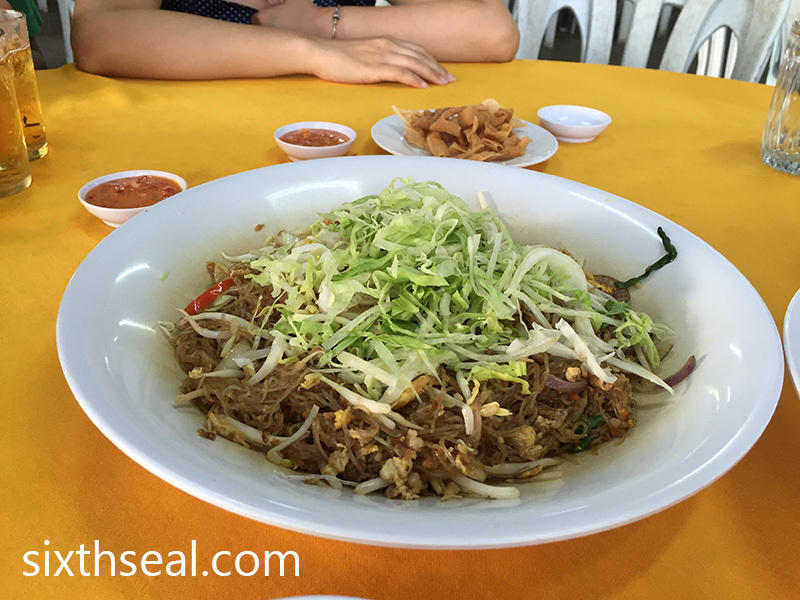 I enjoyed eating the grouper and the small serving of vermicelli is infused with the flavors of the shellfish and seafood. It’s so bomb! 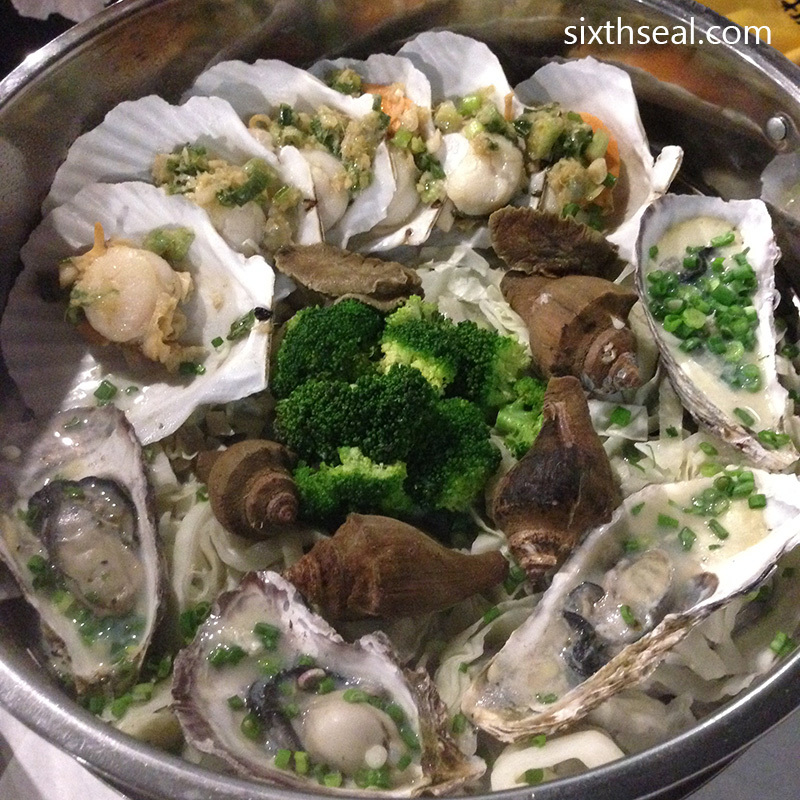 The fourth tier contains the seafood soup. You’ll notice that each layer has holes at the bottom to allow stray juices to drip downwards though each tier. This means the scallops, snails, oysters from the first layer drips down to the clams, octupus, mussels in the second layer which in turn goes into the huge prawns, crabs and lobster in the third layer and everything finally drains into this sweet, sweet broth. Kai’s Plato will give you a serving of pasta to eat with the soup. This is meant to fill you up but we were all very full from the seafood already. The soup was really nice though. I kept a little bit of the crab meat to put into my pasta and seafood soup. The soup is soooo delicious from the 11 types of seafood juices dripping down. 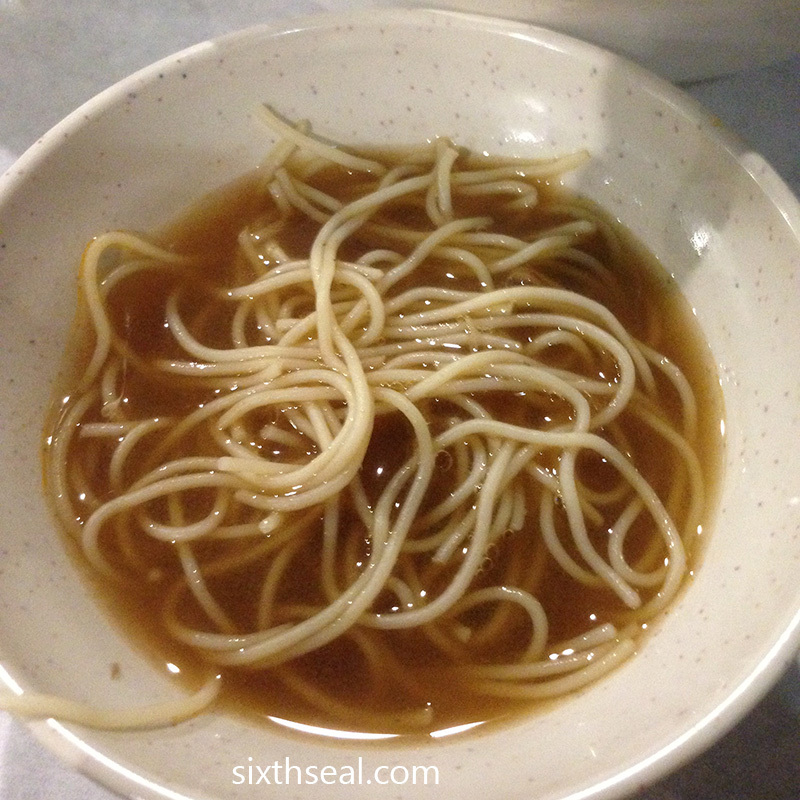 It’s such a treat to finish the meal with piping hot soup. I like how the flame is kept going so the soup is boiling. 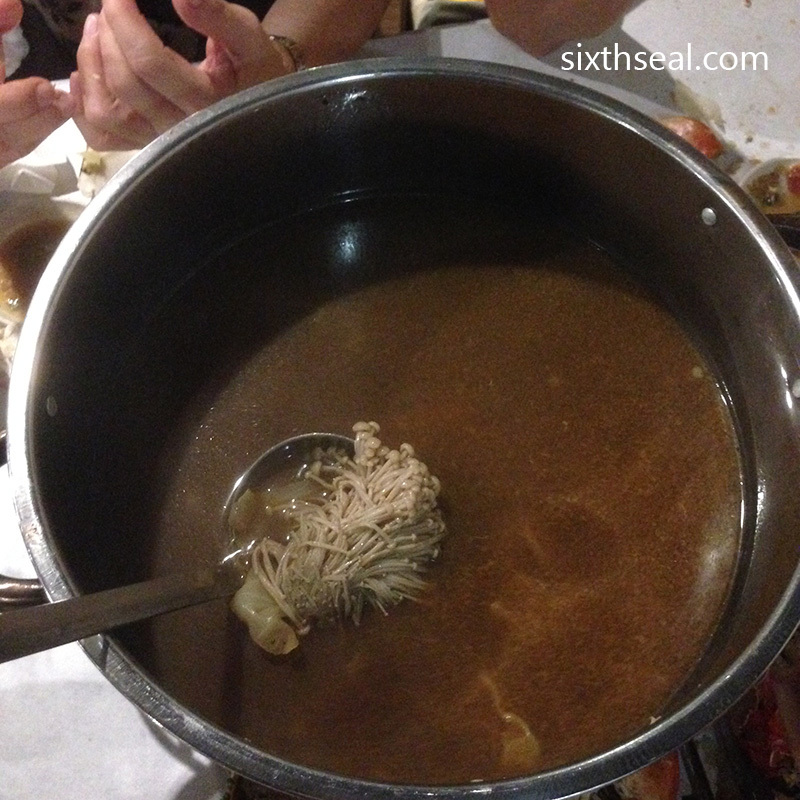 The soup also serves as as steam source to keep the rest of the platter warm. 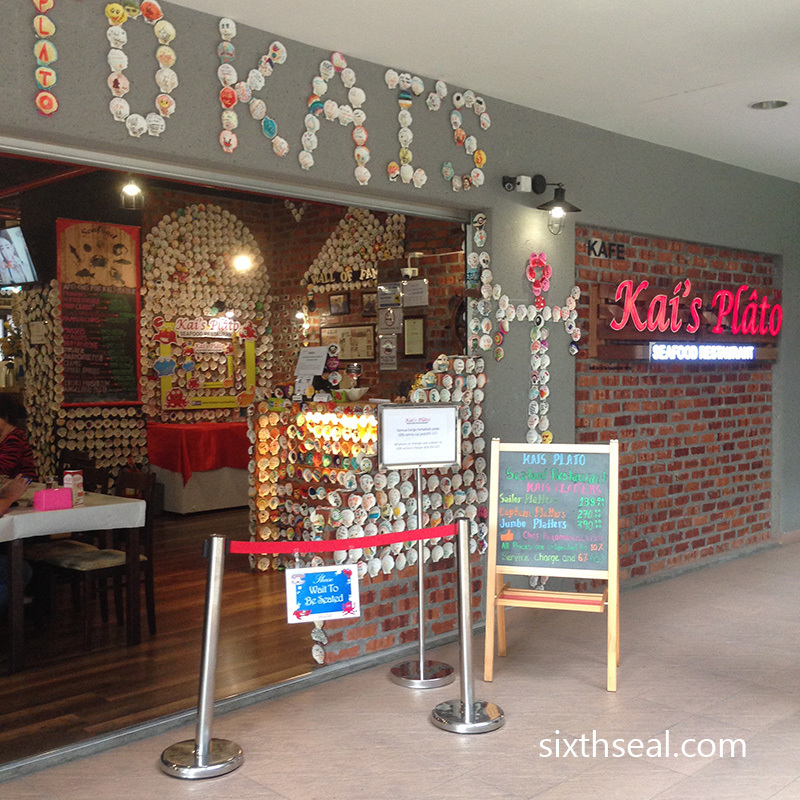 Kai’s Plato works out to around RM 86 per pax. 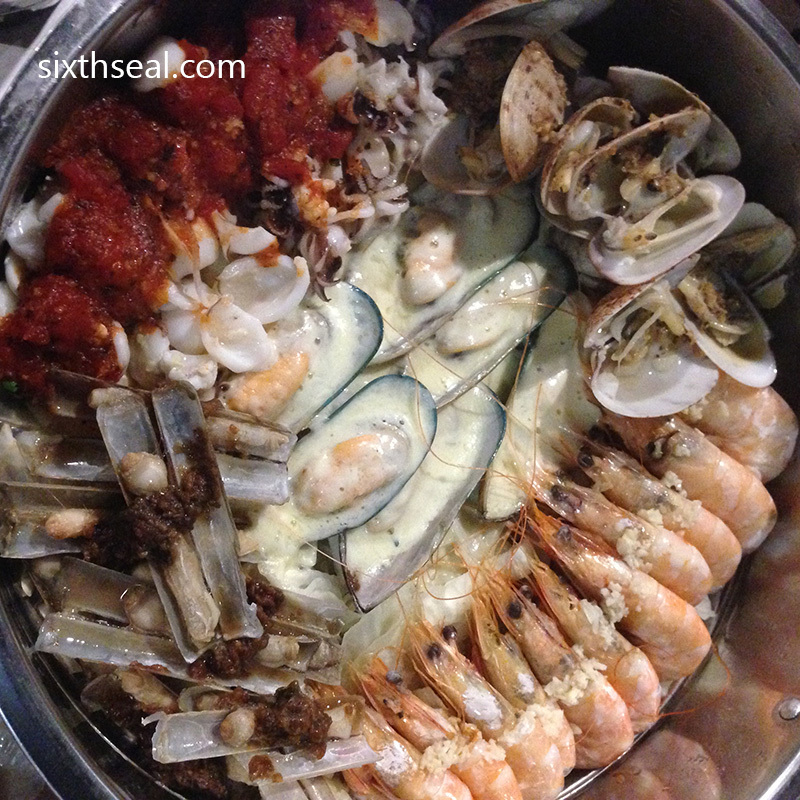 I ordered the Captain’s Platter for RM 270++, which is what they call the set for 4 people. 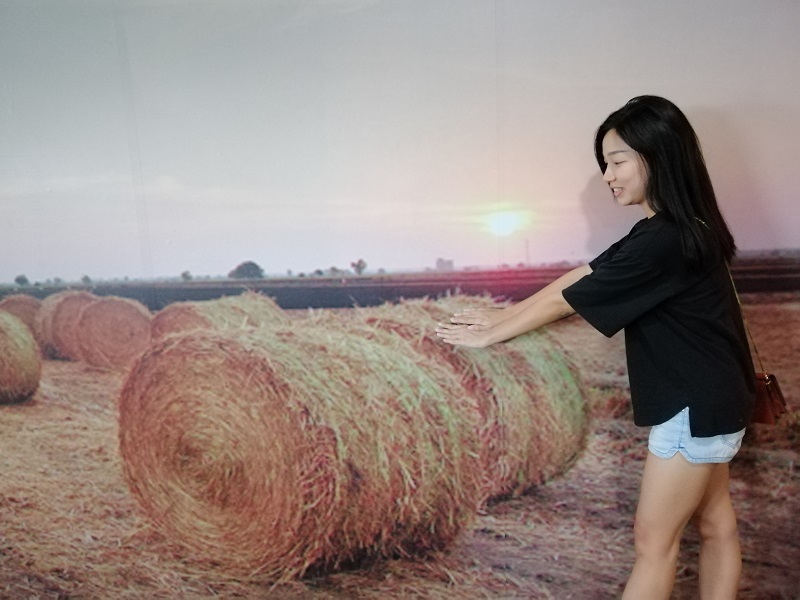 It’s RM 138++ for 2 pax or RM 390++ for a group of 6. We all enjoyed eating with our hands and using the table as a plate. I also learned that my dear’s dad is a collector of snail shells last night. 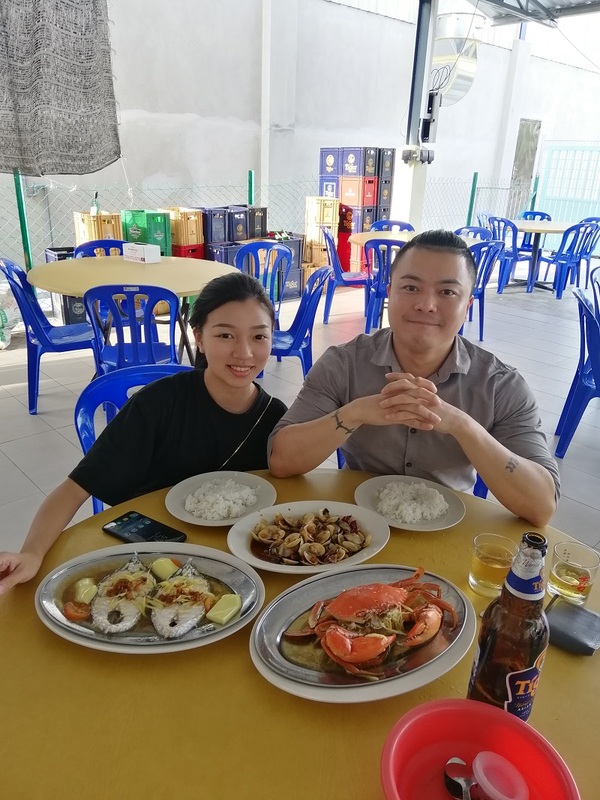 The meal came up to RM 343.60 for the 4 of us which is reasonable for a meal with lobster, crabs, prawns and grouper. I’ll be back again but not for a long while since you can get sick of eating so much seafood. Haha! 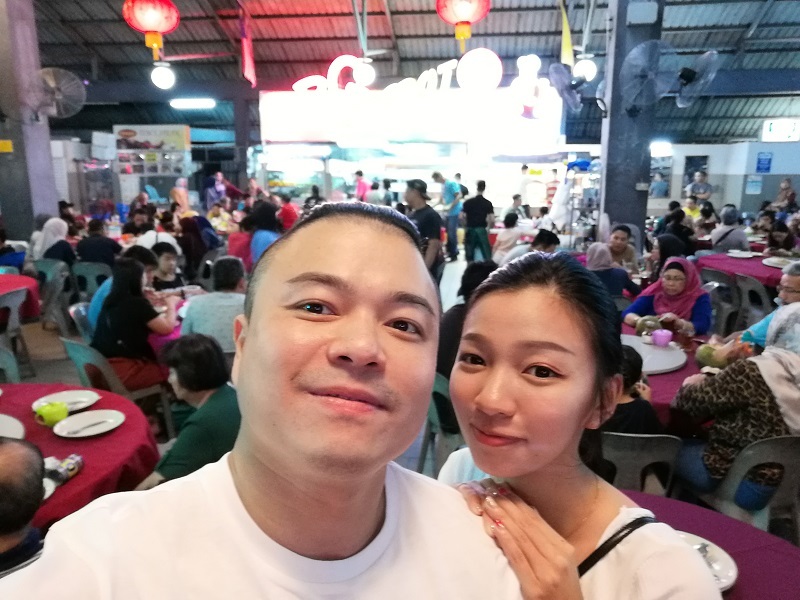 We took a route that brought us through Seremban over the long weekend and decided to eat the famous baked crabs here. 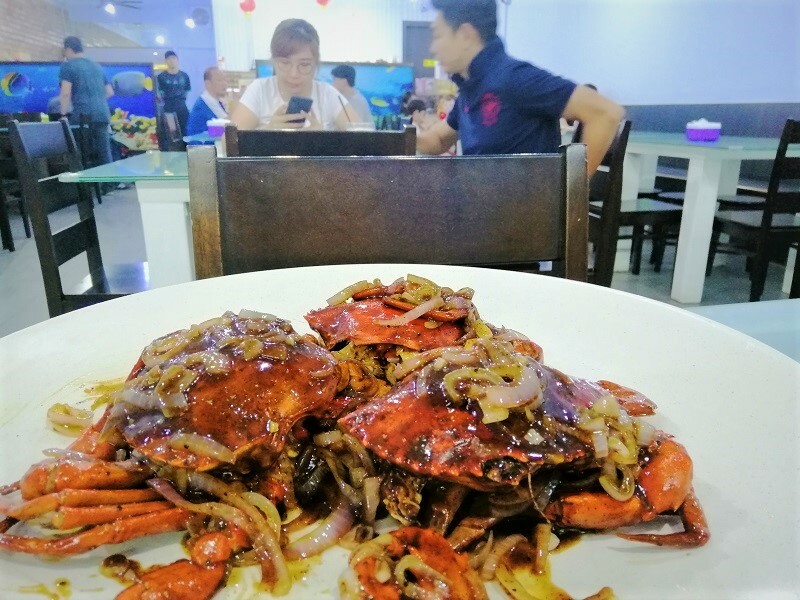 These delicious morsels of crustaceans are grilled (so maybe it should be called grilled crabs) with nothing more than a simple dressing, making it the perfect food for all seafood lovers. 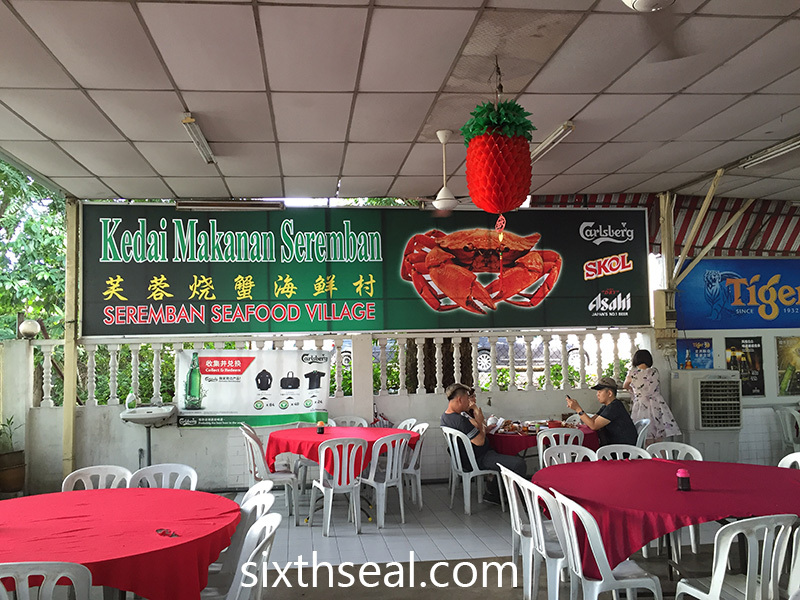 The best place to have the baked crabs is apparently Seremban Seafood Village (Kedai Makanan Seremban). 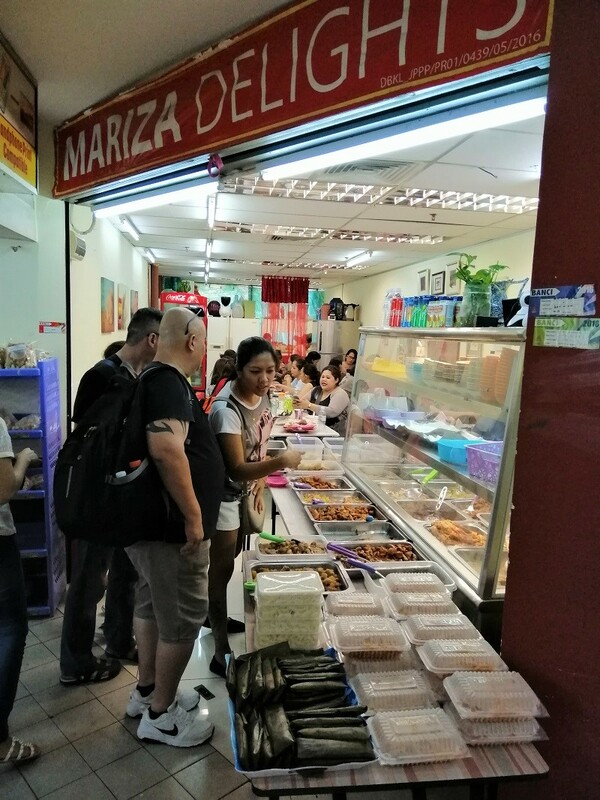 It looks like an unassuming stall that’s located by the roadside until you actually step in. The interior is surprisingly huge! 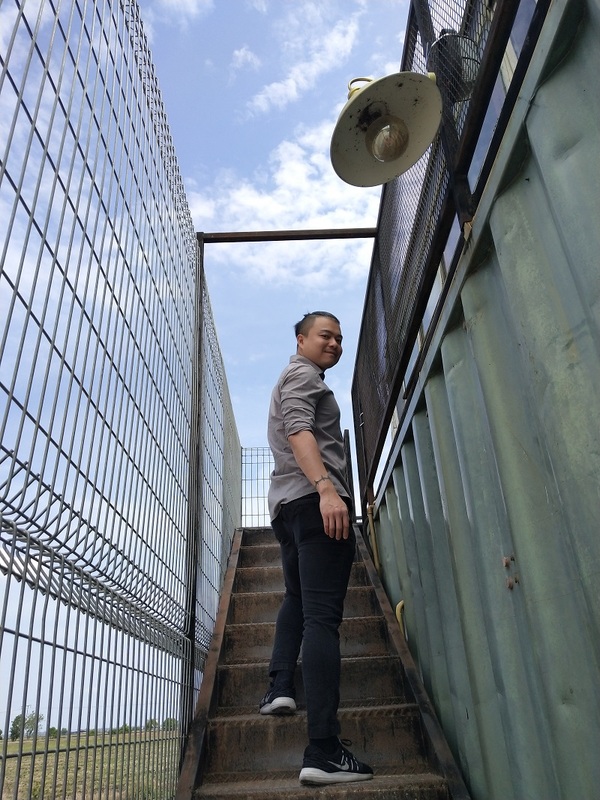 There’s a set of stairs that you’ll have to walk down and it’s almost a cavern inside. 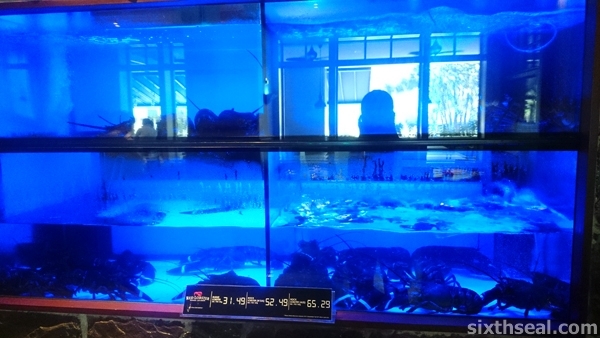 There are lots of pictures of crabs so visitors wouldn’t miss what they’re all about. 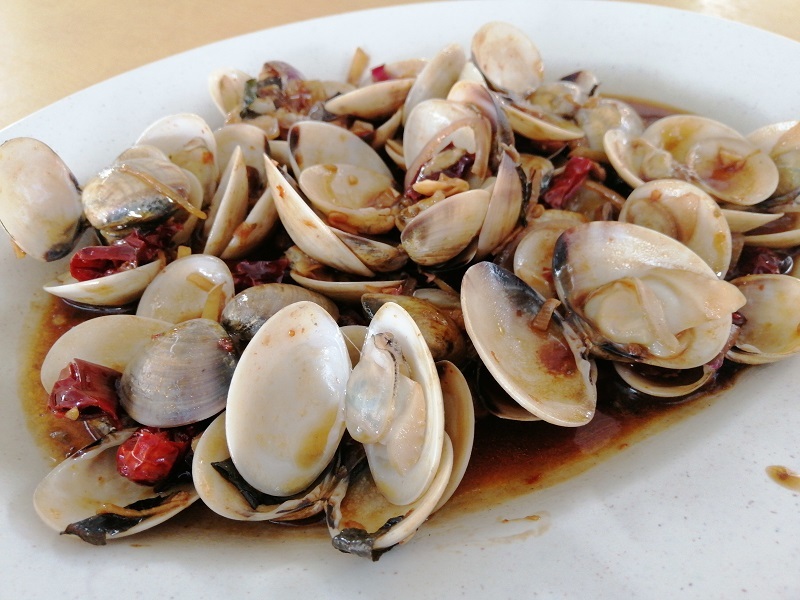 This is the clams people in Peninsula Malaysia love. It’s done in a “soup” (technically a light broth) so the molluscs can shine. 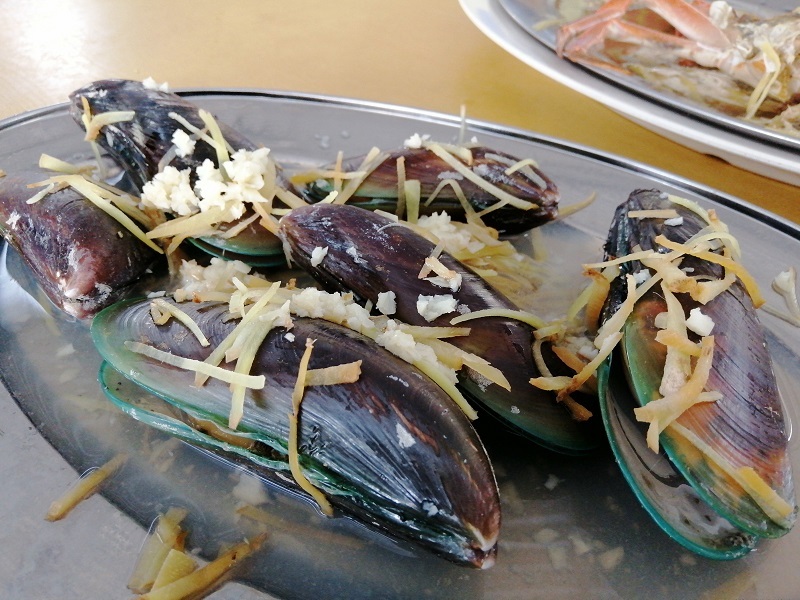 I like how Seremban Seafood Village do the catch justice by applying light and easy cooking methods so as not to overpower the natural taste. 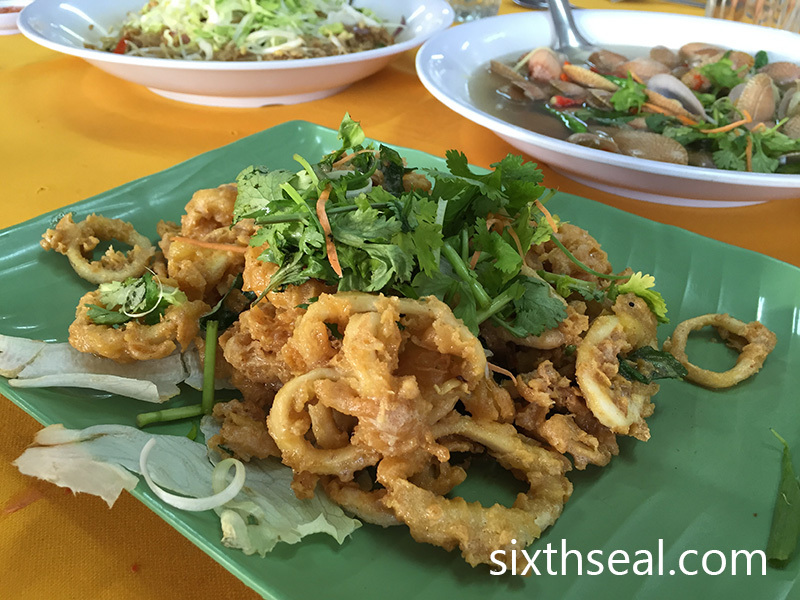 This is Chinese style calamari – the batter is mixed with salted egg so there’s a natural seasoning. We got this for the kids. I thought the batter didn’t stick very well to the squid but then this place is more known for their crabs. I think a hungry person started grabbing at the shoots before my better half could take a photo. This is the obligatory vegetable dish. 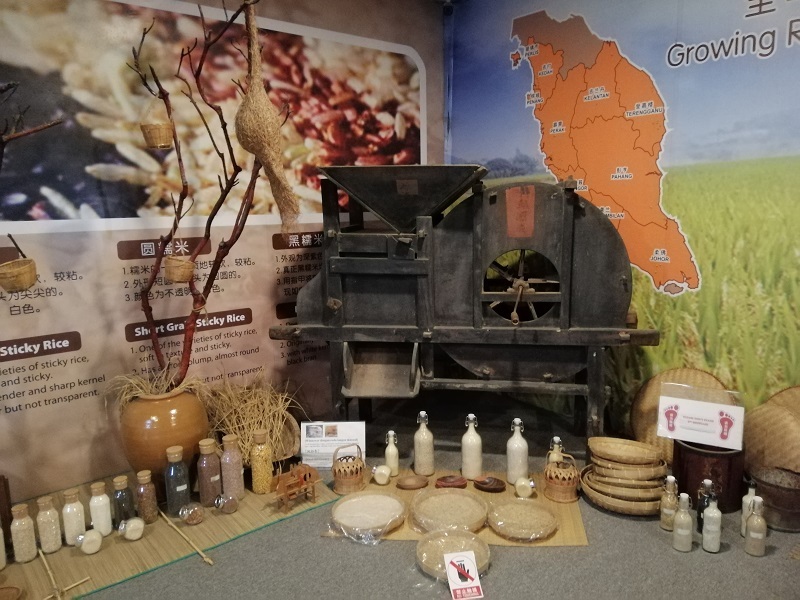 This is the carbohydrate to fill everyone up coz some people didn’t want to have rice. 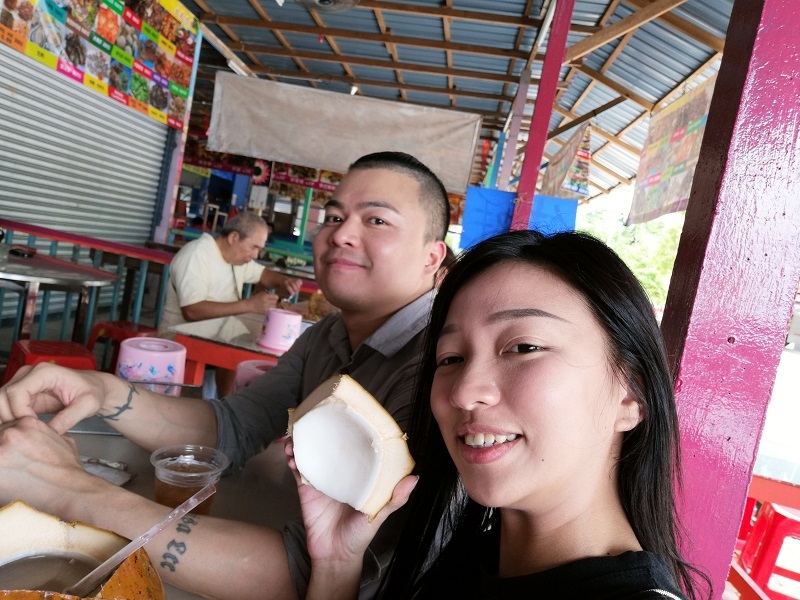 We had this in the late evening for an early dinner after lunch in Melaka and tea at Klebang Original Coconut Shake so we were still quite full. 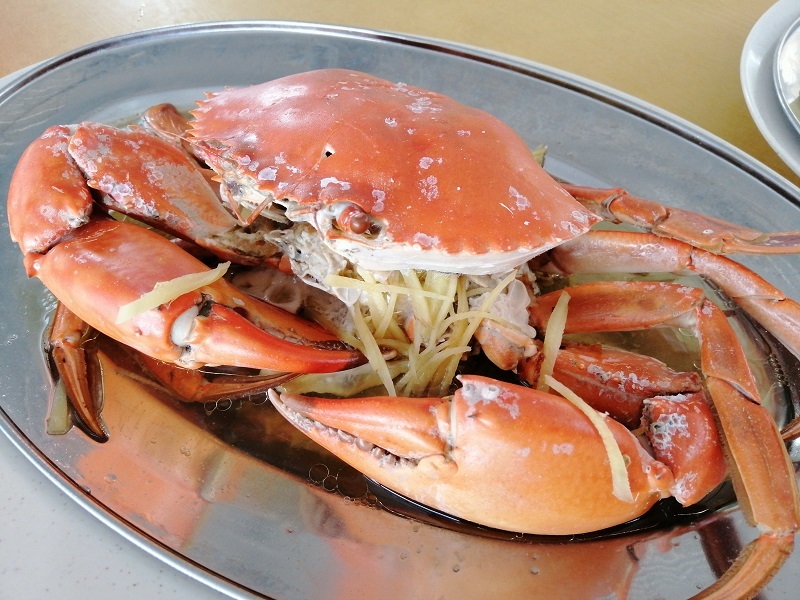 This is the famous Seremban baked crabs! It costs RM 70/kg and we had 3 kilograms. This plate holds 2 kilograms alone. 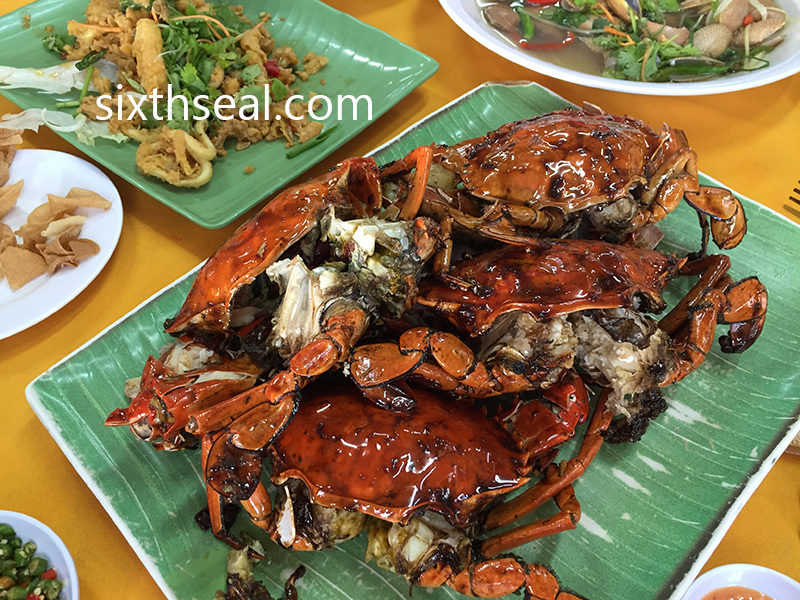 We started picking at the crabs and decided we wanted more so we ordered another 1 kg. Our hands were all sticky then so we didn’t take a photo of the second batch. You should always order smaller batches and add-on since it’s a lot nicer when it’s hot and turnaround is fast. 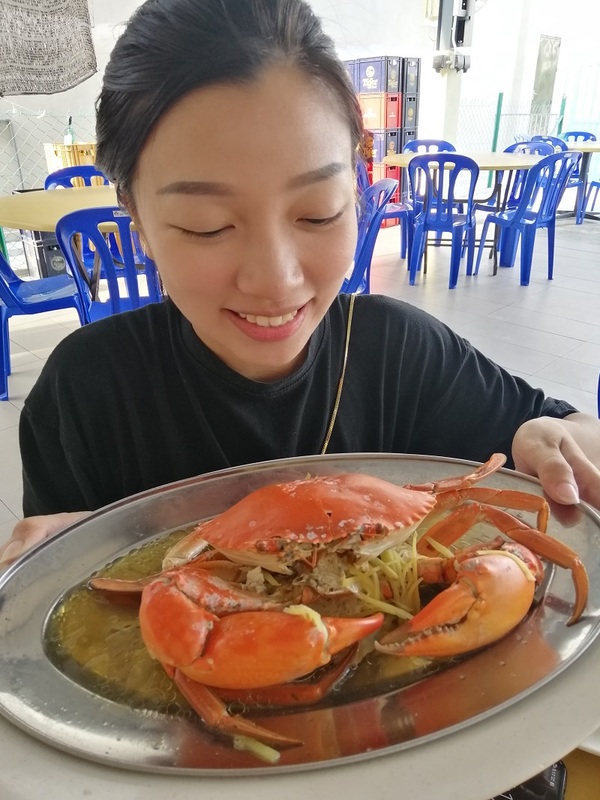 The nice thing is that they try to serve the crabs looking like how they should – it’s just quartered and assembled back. 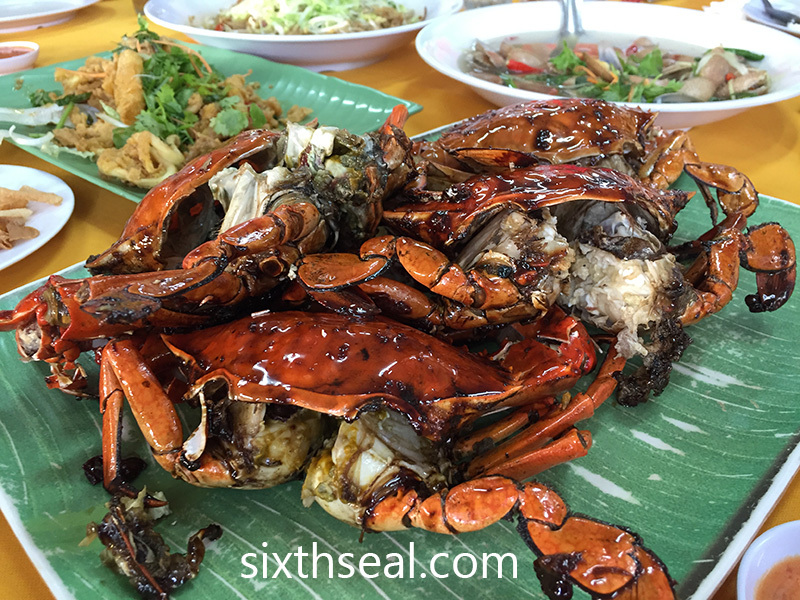 The black stuff sticking to the crab is caramelized soy sauce and it goes very well with the fresh crabs. 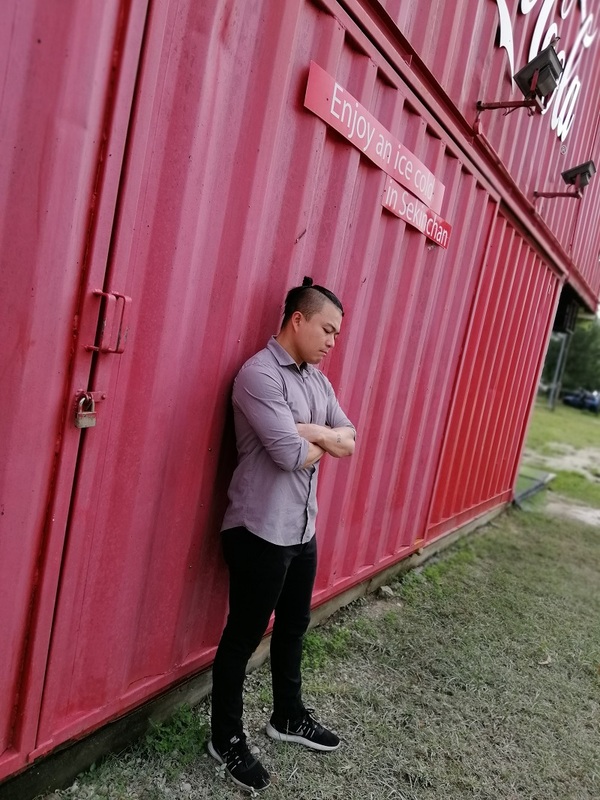 The whole meal cost RM 330.10. I was a little surprised by the amount coz I didn’t have much cash on me but luckily it was enough to pay for the meal. 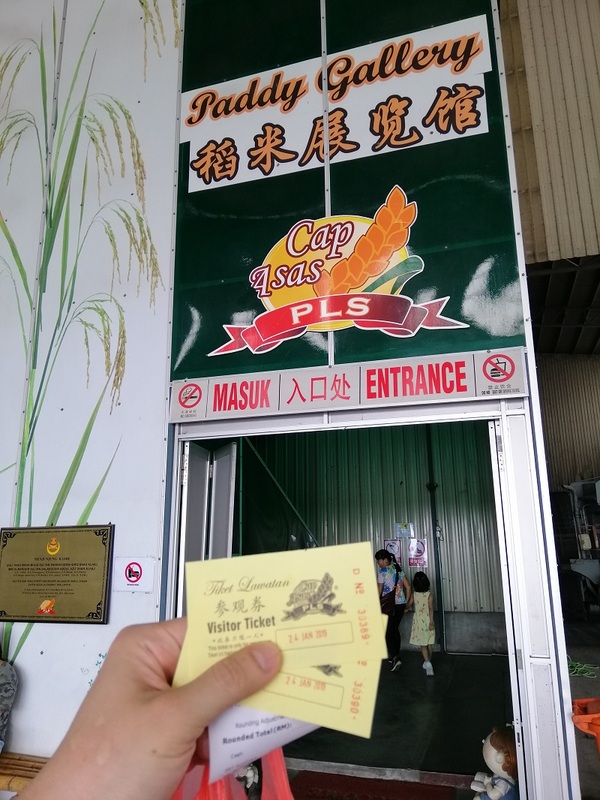 The place also charges for incidentals like wet towels and “tidbits” (deep fried wonton skins served before the meal) but the actual price for the crabs is quite reasonable considering big head prawns are RM 200 per kg in some places. 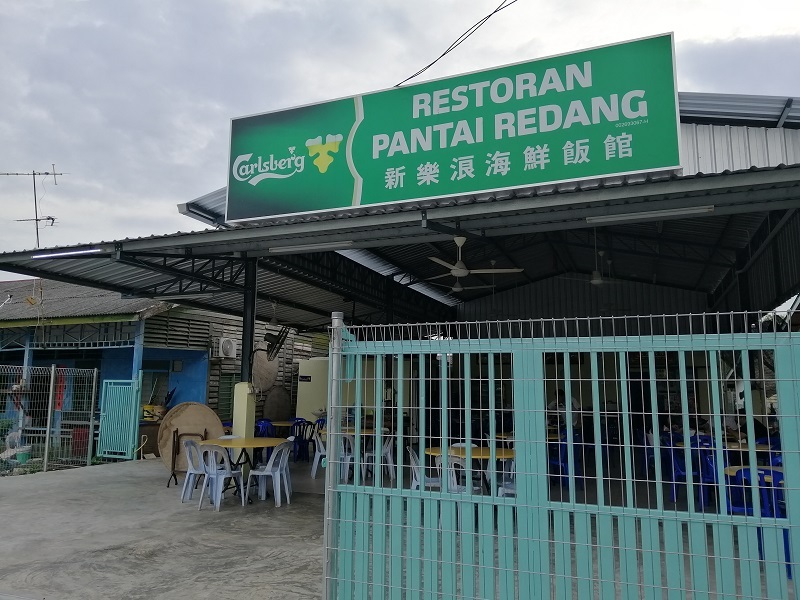 It’s good, I’ll go again for the baked crabs if I’m in Seremban. 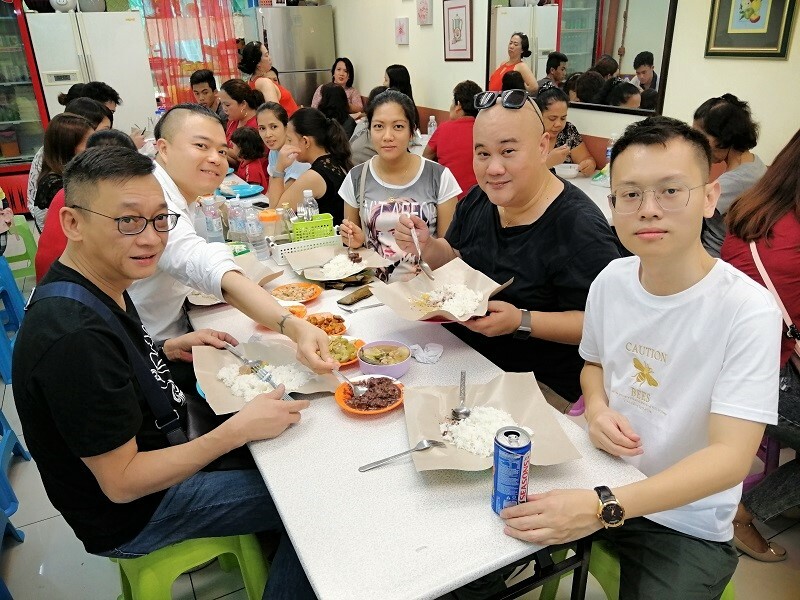 It was just after work and we were at Citta Mall to grab a quick bite to eat. 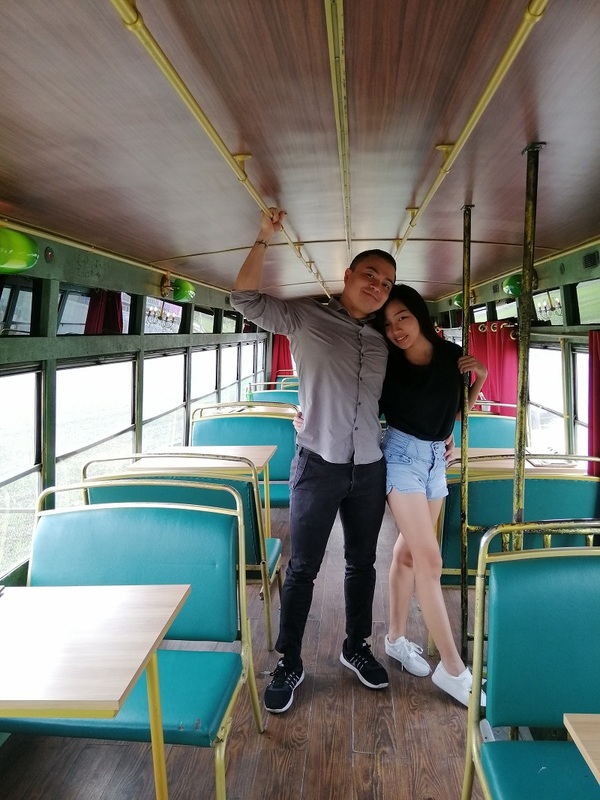 My better half actually wanted to eat something else but I saw an advertisement for this outlet at the escalators and we decided to check it out. 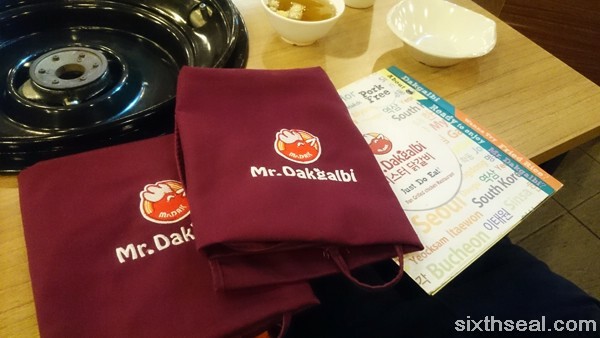 Mr. Dakgalbi is a franchise from Korea with a pretty descriptive name – it tells you what’s on the menu, dak galbi. 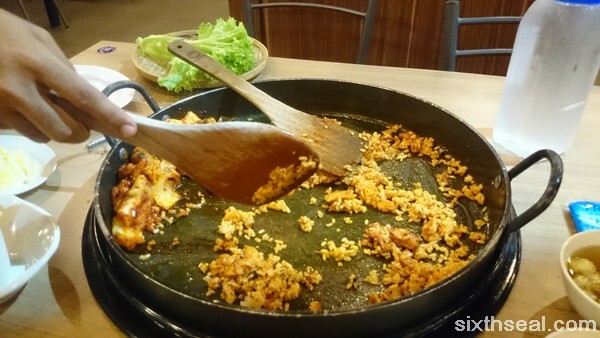 Dak galbi is a Korean dish from Chuncheon, Korea (just like how okonomiyaki is associated with Osaka, Japan) that involves a hot plate and chicken. 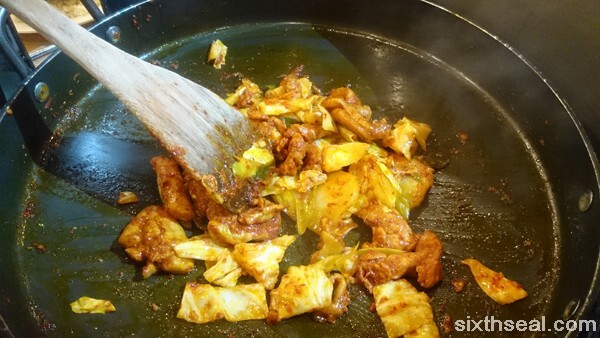 I went for chicken since dak galbi is traditionally made with chicken. 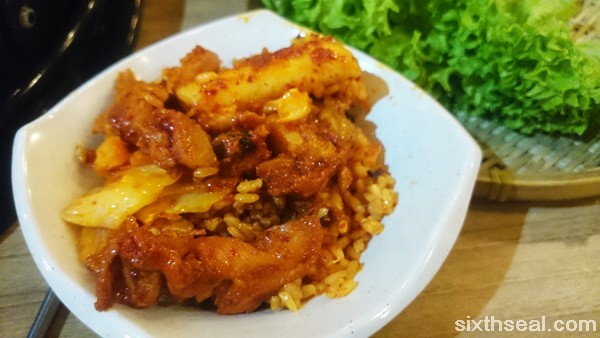 The Mr.Dakgalbi (RM 19) option is their flagship – chicken marinated in traditional Korean chilli paste, potatoes, onions, spring onions and tteok (rice cake). It’s a very common Korean ingredient, I’ve had tteokbokki while in Pusan. 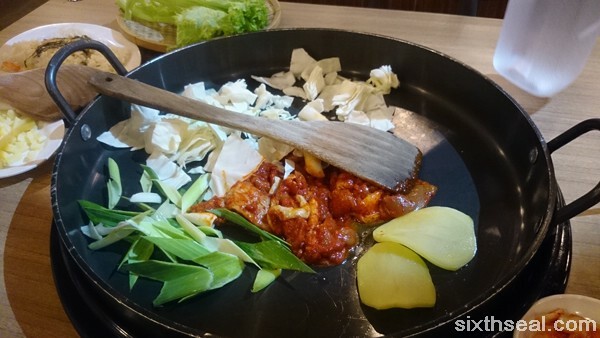 The chicken marinated in gochujang is then sliced into small pieces and fried together with the accoutrements. 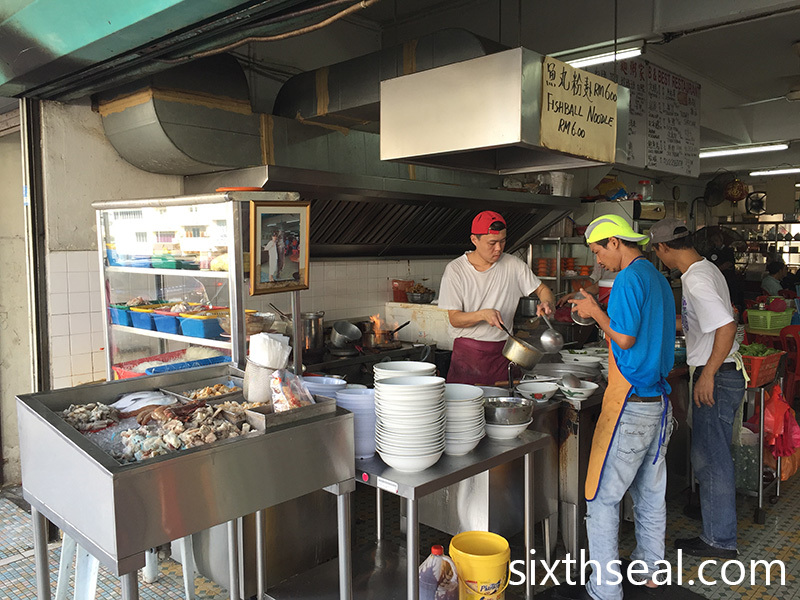 You don’t have to do it yourself – the staff will cook everything for you, much like Palsaik. It seems like full service Korean restaurants is very big here. Next up, is choosing the carbs. I asked for rice (RM 6) and cheese (RM 6). You can also ask for ramen (RM 6) if you like. This is fried together with your chicken and then the entire thing is ready to eat! 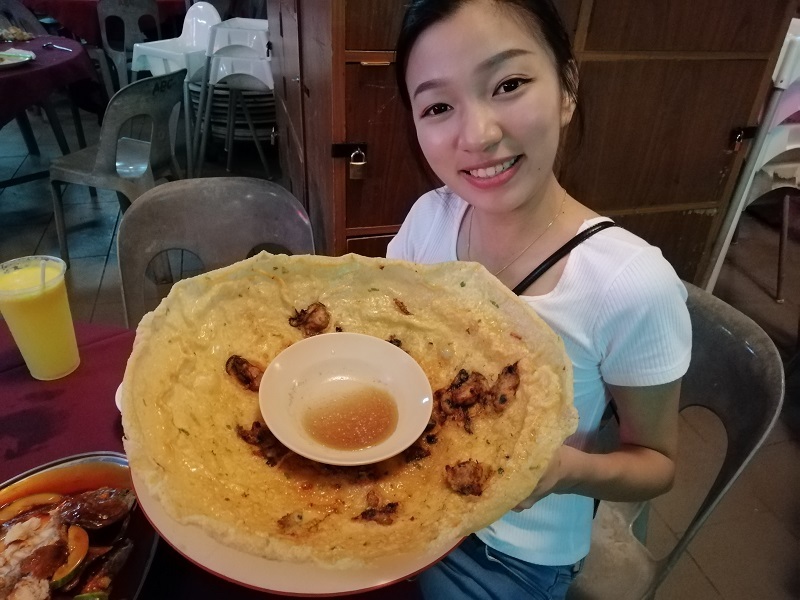 The staff will also portion your chicken into two portions just in case you want to add on, and if you don’t, your leftover rice will be made into a sort of pizza. 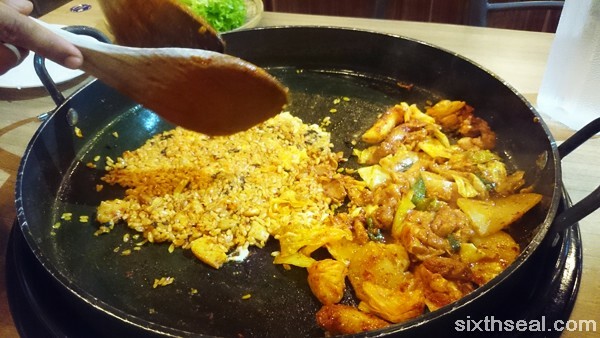 It eats like the bottom of claypot chicken rice – the caramelized and crispy bottom is nice. It’s pretty decent but if you don’t like gochujang or have small kids, you might want to order something else since the signature fermented Korean chilli paste can be quite spicy for sensitive palates. 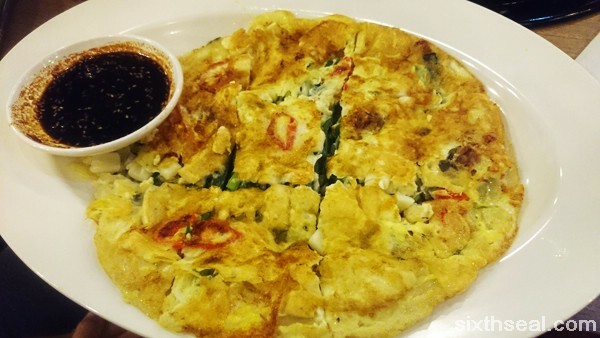 We also ordered Seafood Jeon (RM 19) – a crispy Korean style pancake. 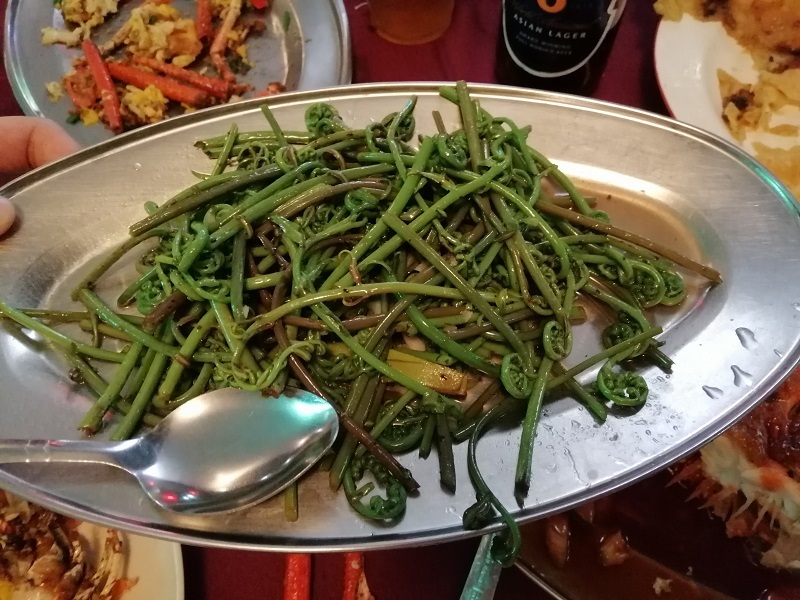 It looks nothing like what the menu promised (the picture in the menu had large octopus tentacles practically burying the jeon) and it tasted about as appealing as it looked. Dismal. I guess we should have stuck to ordering the namesake from Mr. Dakgalbi. 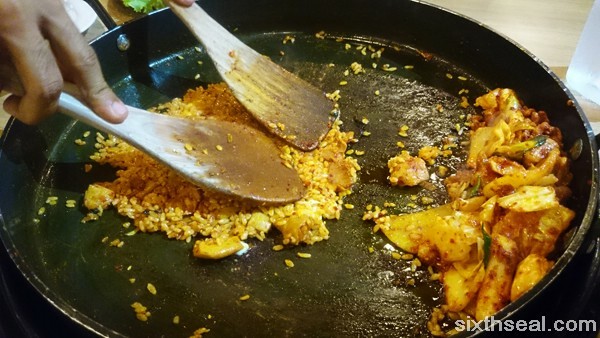 Their dak galbi is alright and it can feed two people easily. 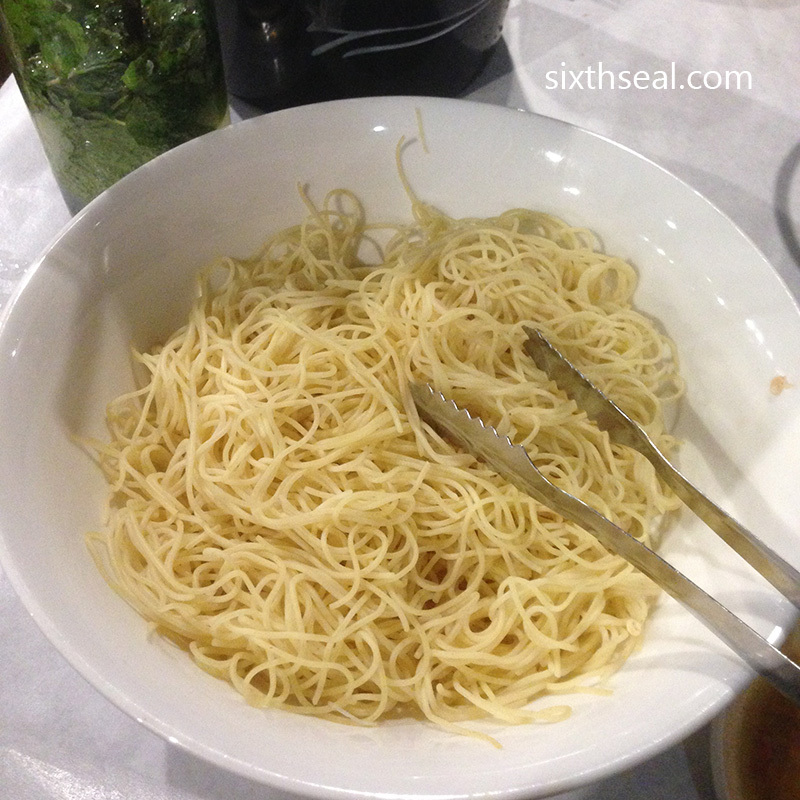 You can also add rice, cheese or ramen as much as you want at a price of RM 6 per portion/plate. 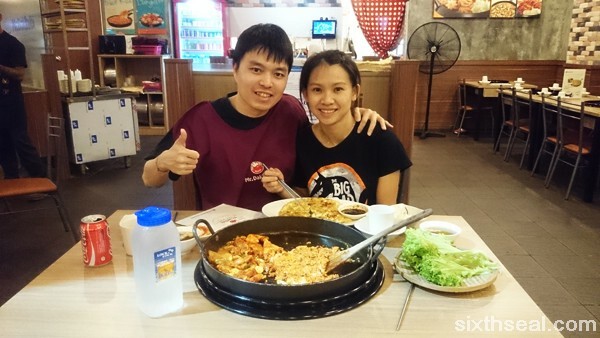 Thus, our dak galbi is actually RM 30 (RM 19 chicken + RM 6 rice + RM 6 cheese). It’s not good enough to make me want to make another trip back soon and their menu is pretty one dimensional. 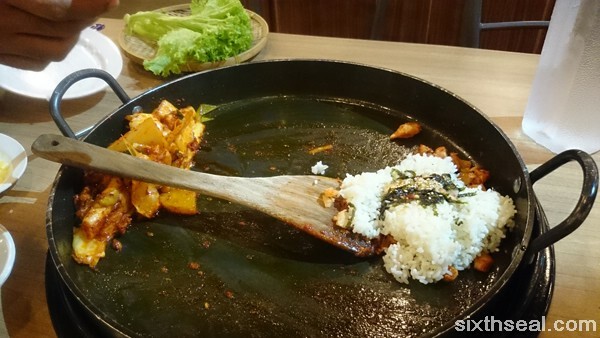 However, I’ll drop by if I have a dak galbi craving (or have an urge to dress up in aprons) since it’s quite close to us. 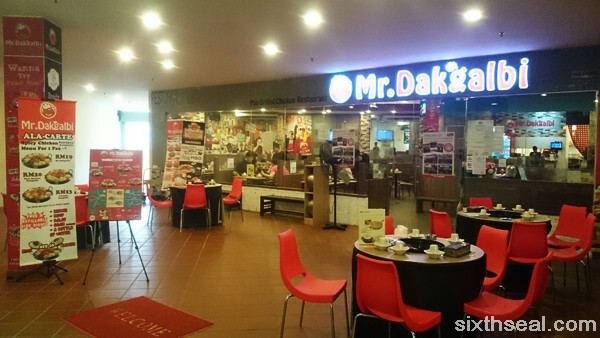 The Mr. Dakgalbi restaurant in Citta Mall is very empty though – it was just the two of us inside before another couple walked in. 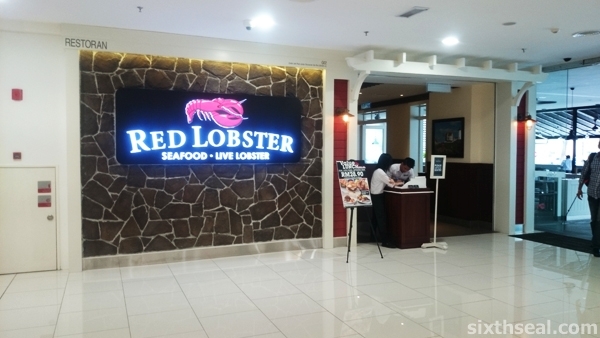 I didn’t really pay attention to the launch of Red Lobster Malaysia so I was quite surprised to see the Red Lobster marquee while at Quill City Mall. 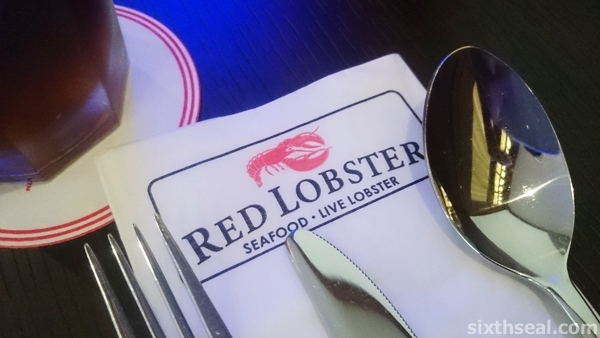 I was there with a friend and wanted to see if it was the same Red Lobster as the US casual dining restaurant so we popped in to check it out. 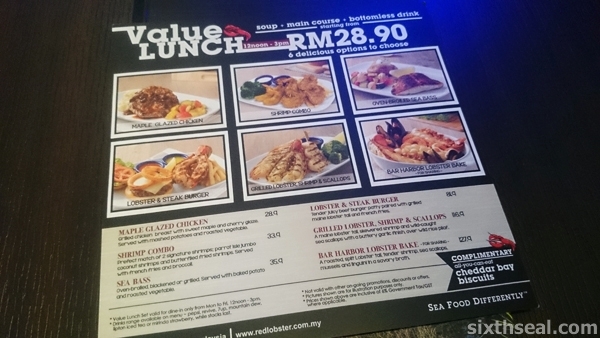 They have a very misleading lunch promotional menu which says “Value Lunch RM 28.90 with 6 delicious options”. The Fine Print (TM) of “starting from” really pushes the definition of the term but who in their right mind would think lobster would come at less than RM 30? 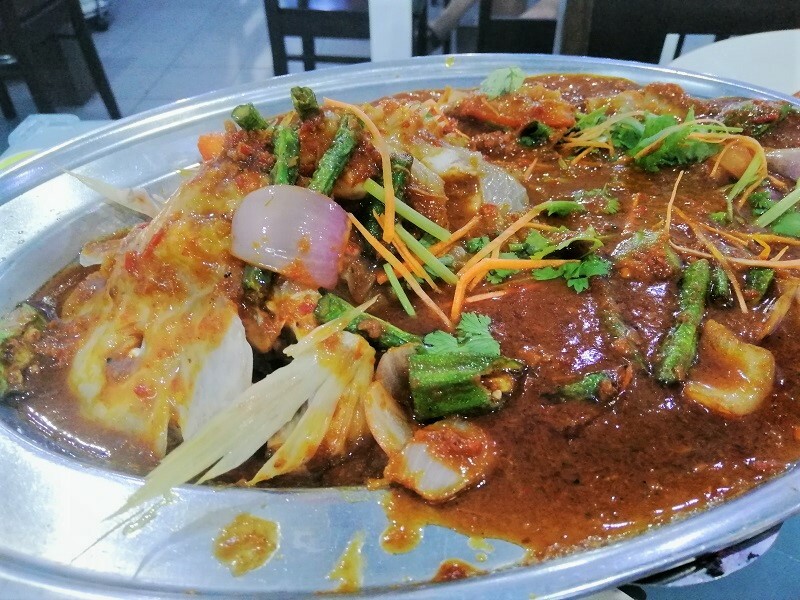 I had browsed the menu and spotted the same item I wanted to order at RM 84 but I feel that this has created a lot of ill-will among the public. 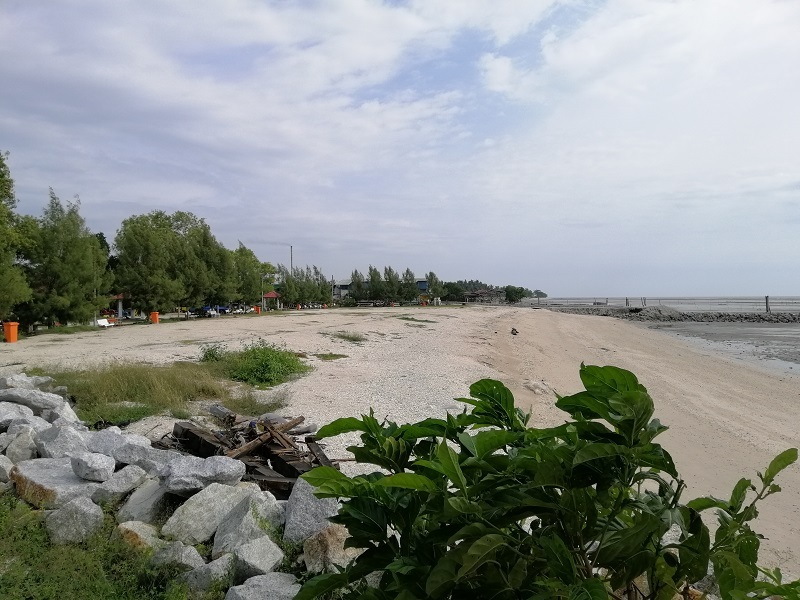 It seems that Red Lobster Malaysia has some teething problems which resulted in a lot of angry customers but most of that seem to be price or service related. It’s been proven that good service actually increases the enjoyment of a meal and we had great service from the wait staff. Granted, we were the only ones there and the staff to customer ratio was 4:1. 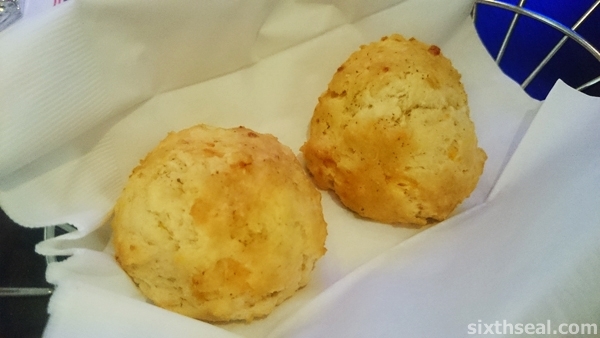 We were seated inside and provided with complimentary Red Lobster Cheddar Bay Biscuits. I love the warm and cheesy biscuits, but the presentation could do with a bit of work – it was served on a tray with serviettes (!!!). I would have expected something a little better from a place like this, at least spring for a nice piece of linen to keep the biscuits warm. The complimentary soup wasn’t interesting at all but that wasn’t why I came here. I ordered the Lobster & Steak Burger (RM 81.50). 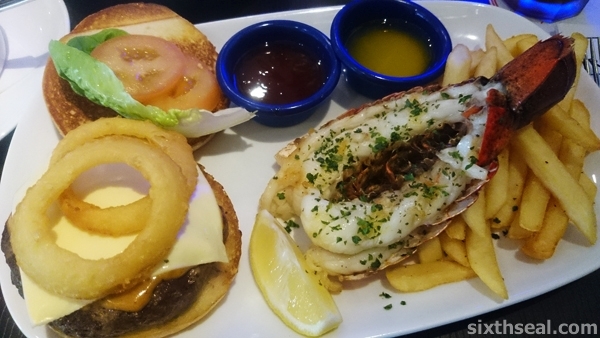 It’s a dish of “tender juicy beef burger patty paired with grilled Maine lobster tail and French fries”. I loved my burger! I had ordered it medium and it came out exactly medium. It was succulent and juicy and positively dripping with bovine goodness. The grilled Maine lobster tail was awesome too, especially with the butter sauce. The hot sauce was addictive as hell too! 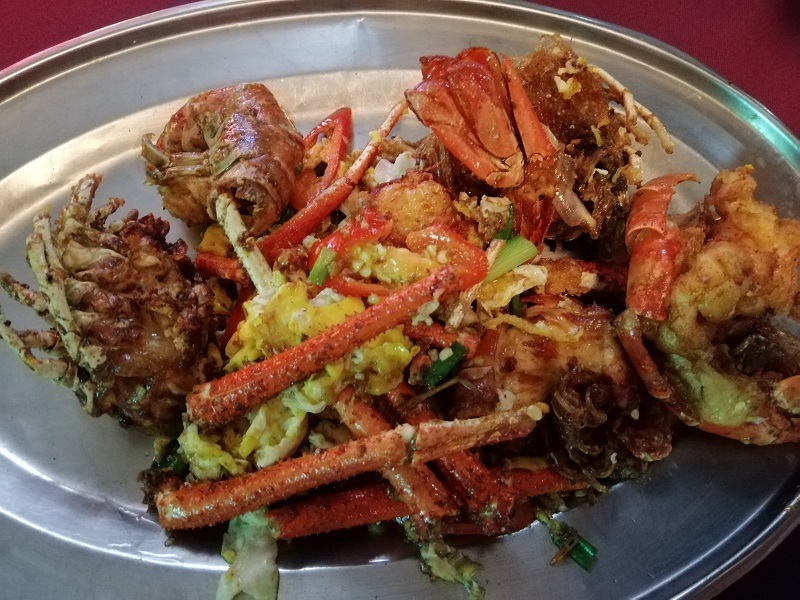 My friend went for the Bar Harbor Lobster Bake (RM 127.90). This is supposed to be a sharing dish but we were still quite surprised at the portion. 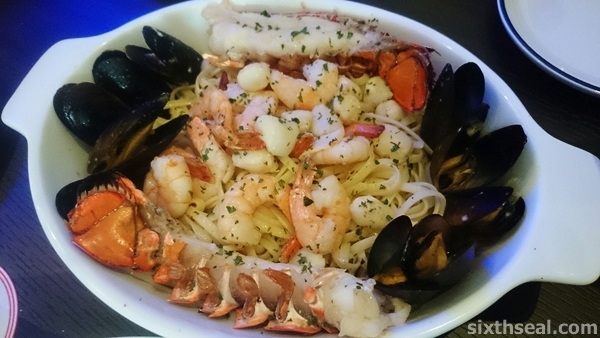 It’s a “roasted, split lobster tail, tender shrimp, sea scallops, mussels and linguine in a savory broth”. I can’t say I enjoyed the pasta much, it was slightly gloopy but the lobster was good. The sea scallops and mussels were on the small side (especially the former) and didn’t add much to the dish. It was still better than the appalling Lobster Thermidor I had in Harrod’s KLCC. 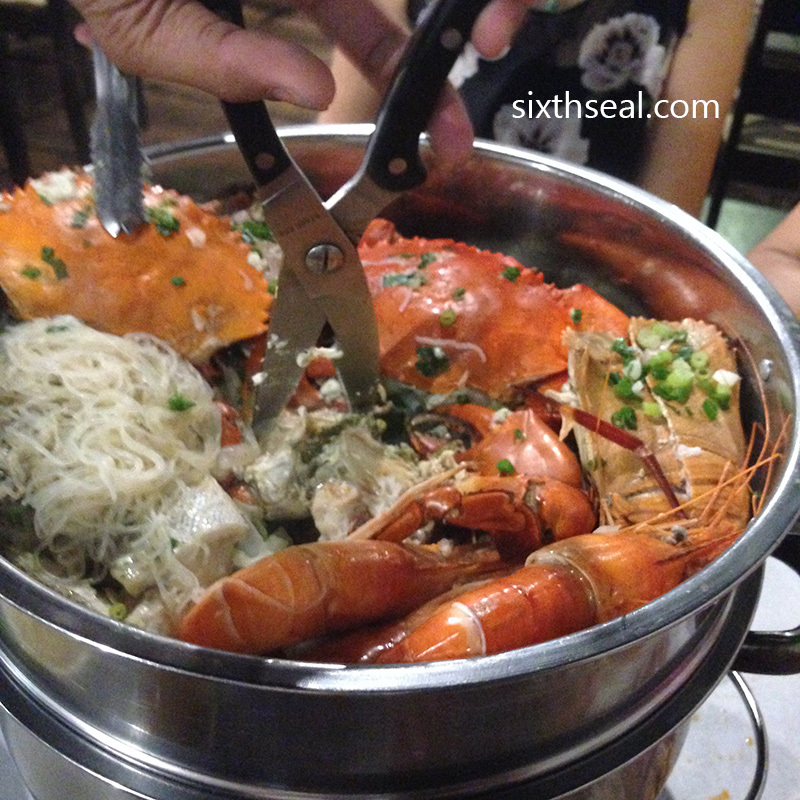 I thought Red Lobster Malaysia does what it does very well – lobster! 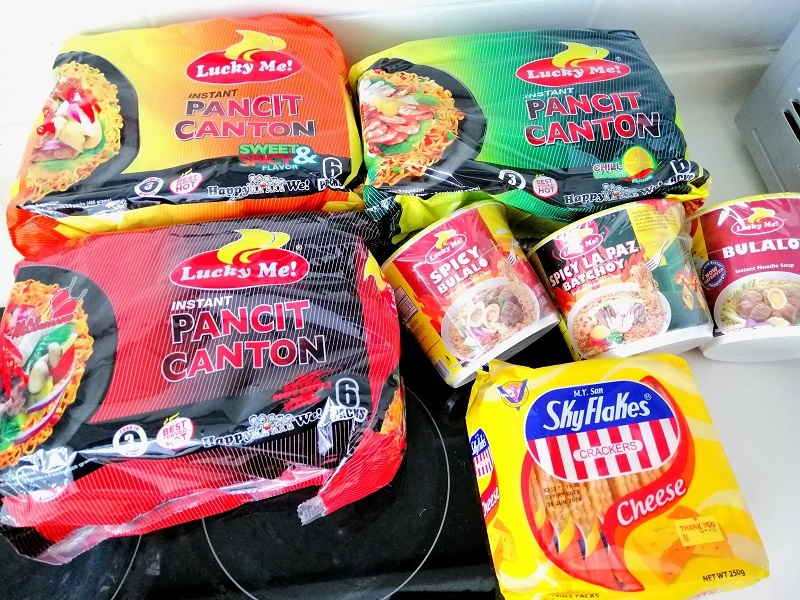 The other dishes aren’t that great. I went for the burger coz there was a LongHorn Steakhouse directly beside this outlet sharing the same kitchen and it was super! 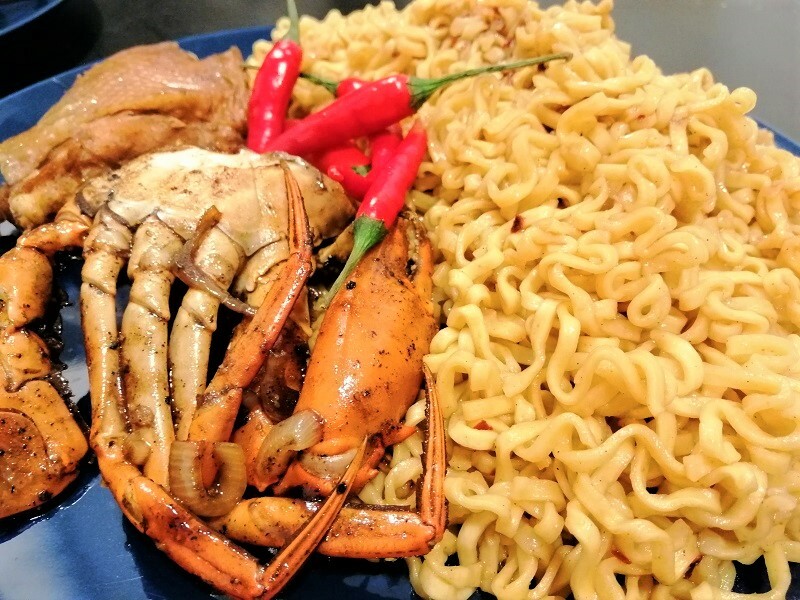 I feel that if you go, knowing that it’s a casual dining restaurant that doesn’t accept reservations (like Chili’s), stick to what they know best (lobsters) and don’t mind the high prices (use a corporate expense account) you’ll love the food. I sure did. 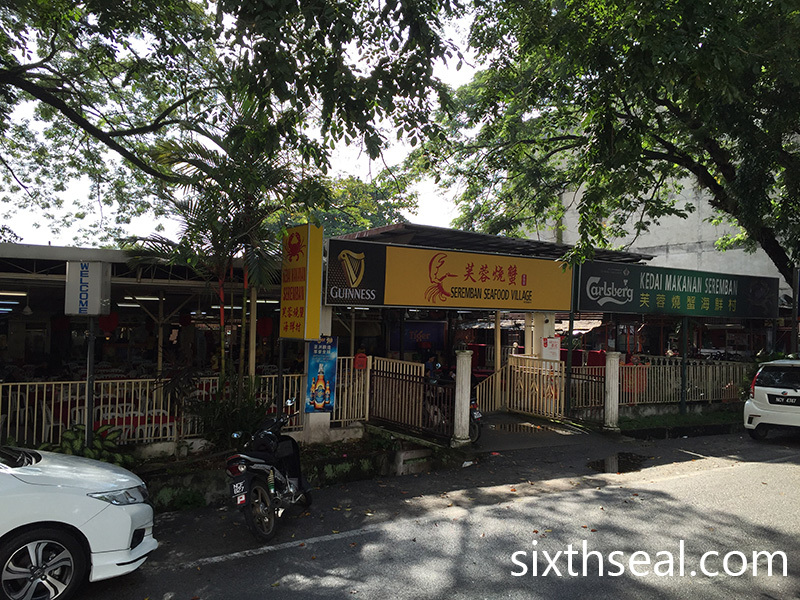 This is my favorite place to eat fish noodles! 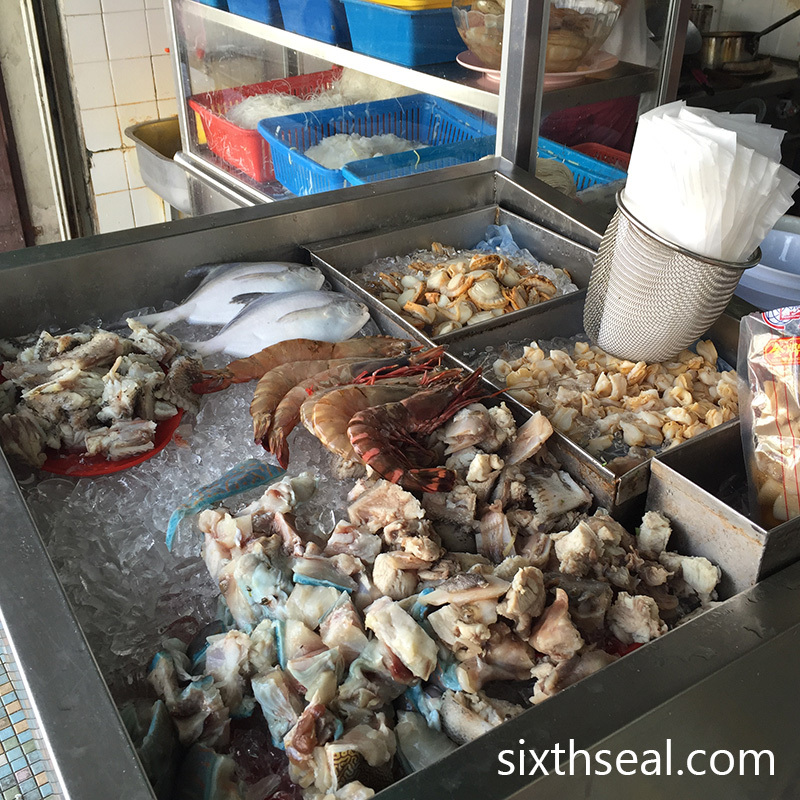 It’s really fresh as they source the fish directly from fishermen and slice it on-site. 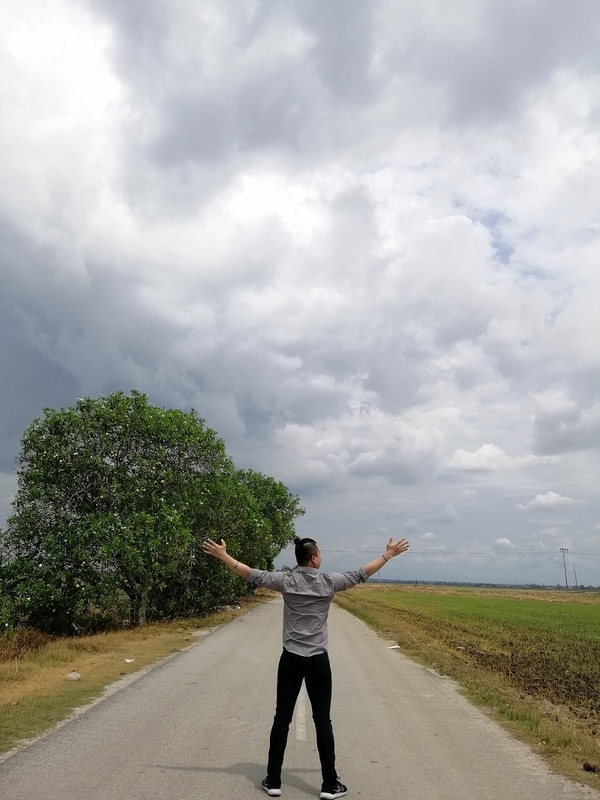 That’s a whole Ma Yau (Threadfin fish) above. 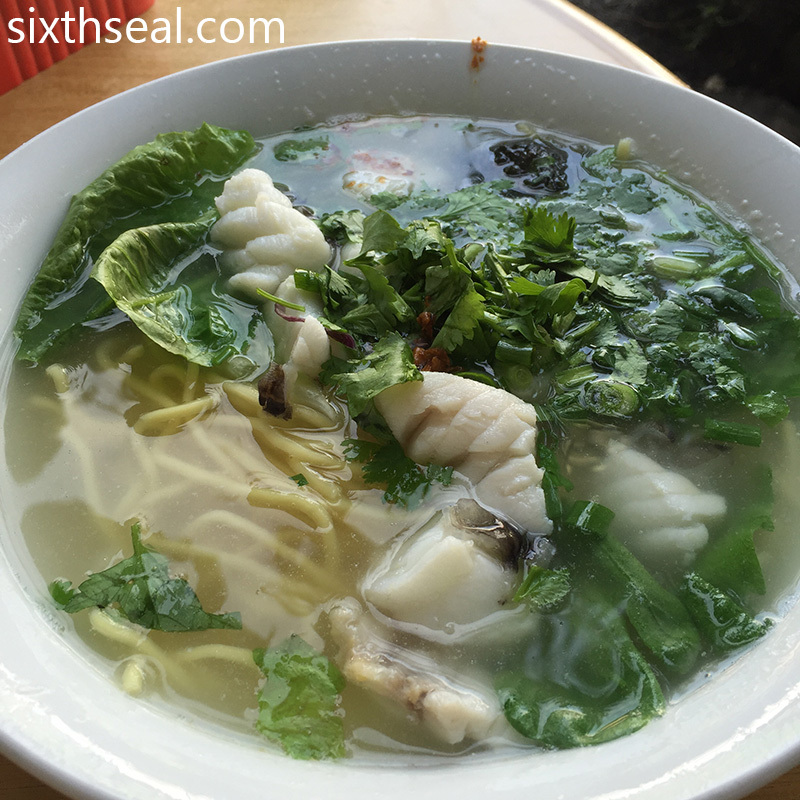 You have to go really early in the morning before they run out of fish so the long weekend was a great time for me to eat all the types of fish noodles they have. Haha! 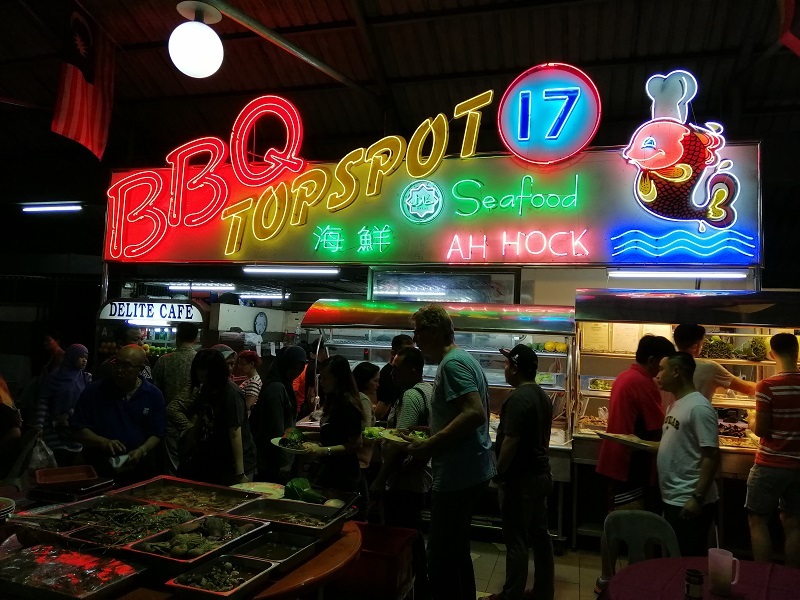 Ah Po Fish Noodles carries a lot of different types of fish with prices ranging from RM 14 – RM 22. You can ask to have a peek inside their cooler to see what they have. Yes, one of those plates equals one portion of fish! 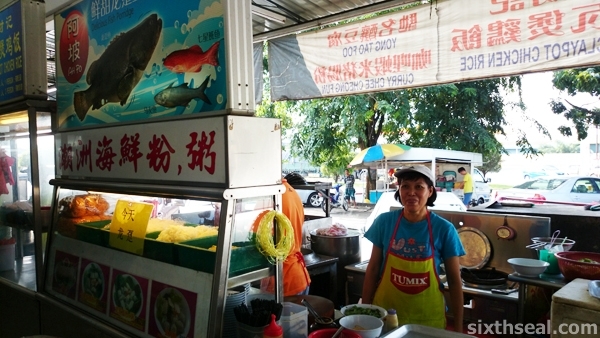 This stall is actually at the *same* coffee shop as Min Yee Estuary Grouper. However, you get more options here and (arguably) better quality fish. 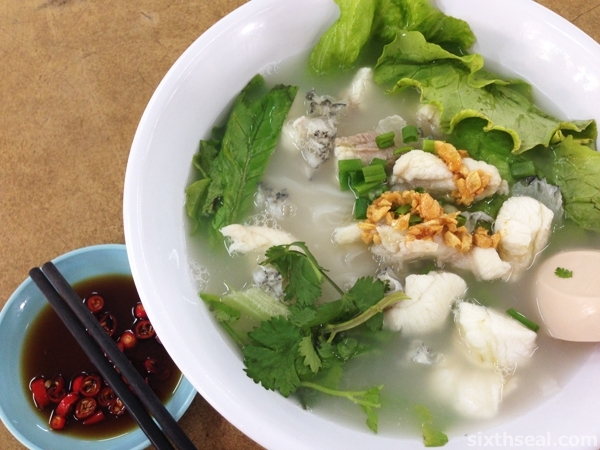 Their flagship dish would be the Estuary Garoupa Fish Noodles (RM 22). 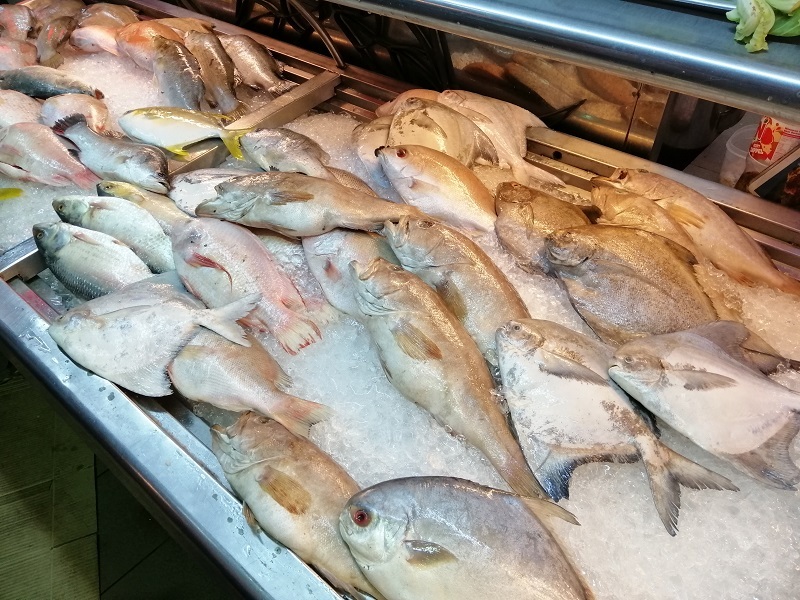 This is RM 4 more expensive than Min Yee but the cuts of fish are better. Ah Po uses the prime cuts with lots of fatty collagen and it’s really good while Min Kee seem to use offcuts. 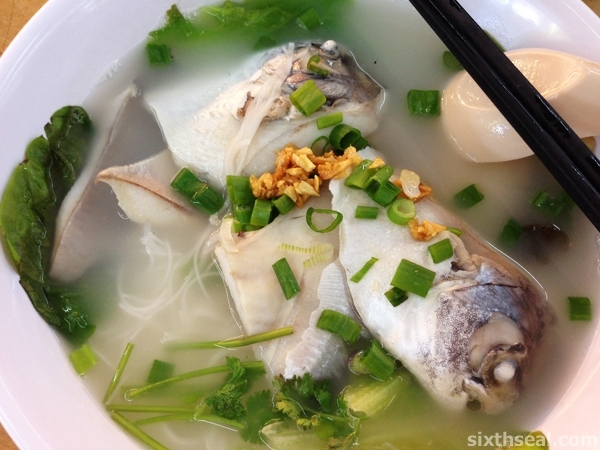 I prefer the fish from this stall but the cleaner broth from Min Kee. 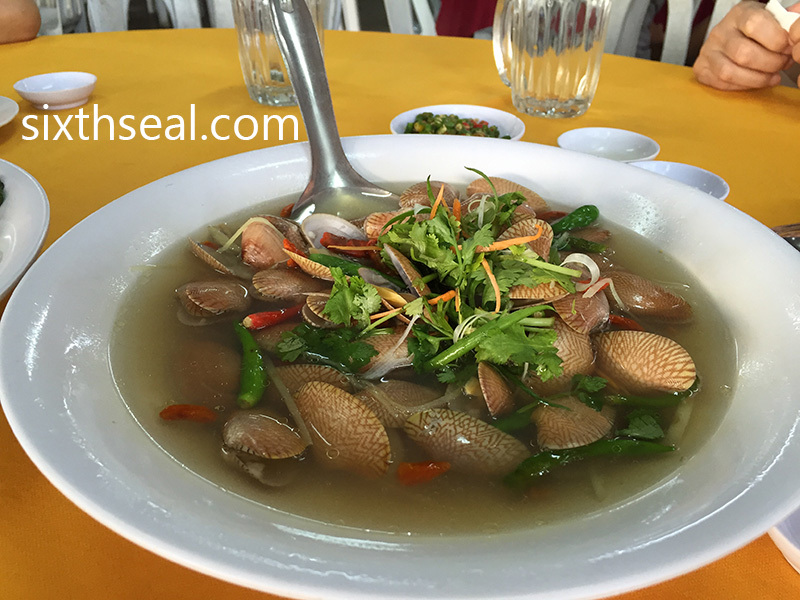 The cheapest fish noodle you can get here is the White Pomfret Fish Noodles (RM 14). 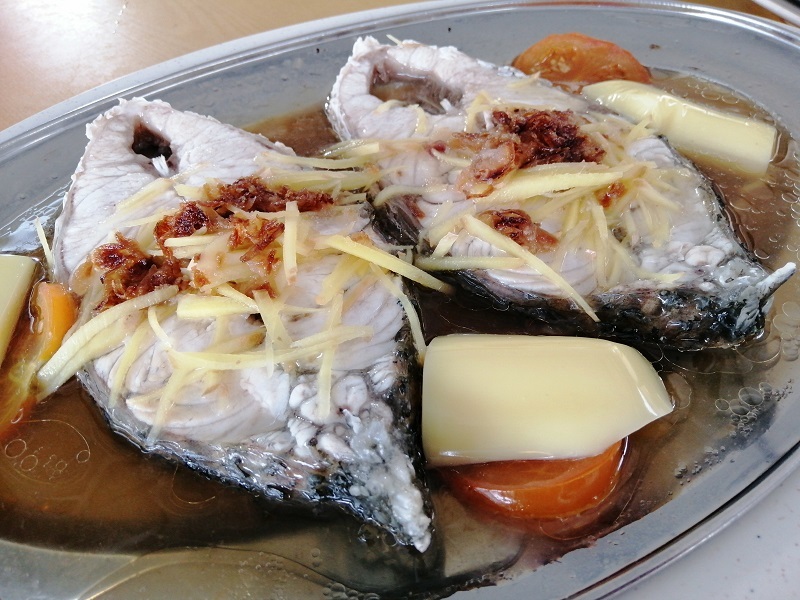 This is a whole fish and since it’s a white pomfret, it can be really bony so watch out for bones! 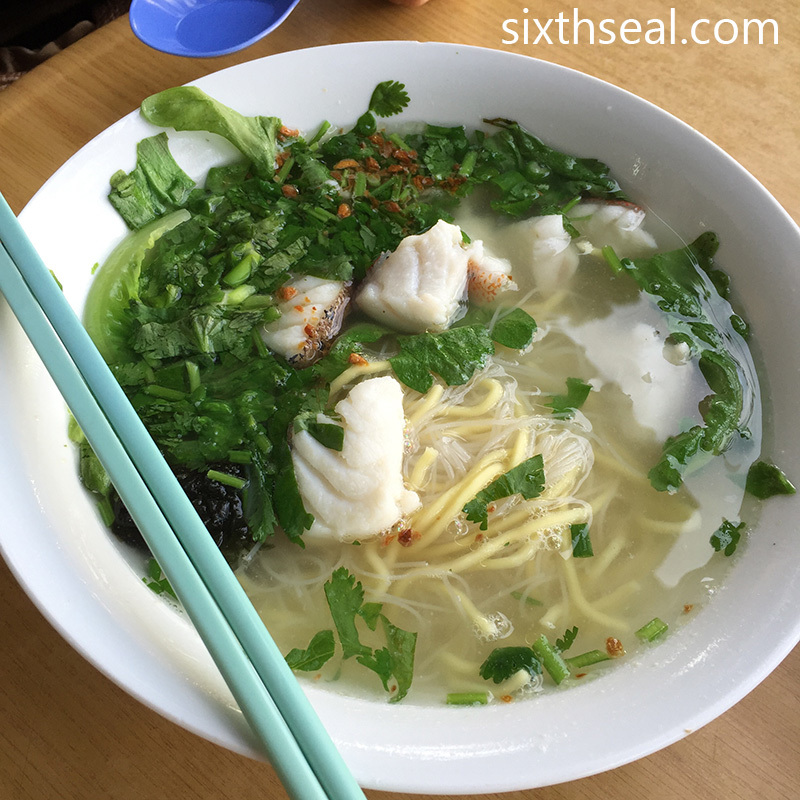 If you love eating fish noodles though, that wouldn’t be a problem. 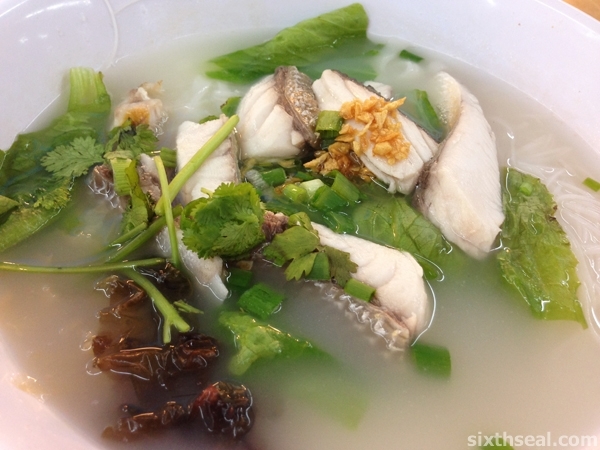 The mid-range offering is Threadfin Fish Noodles (RM 18). 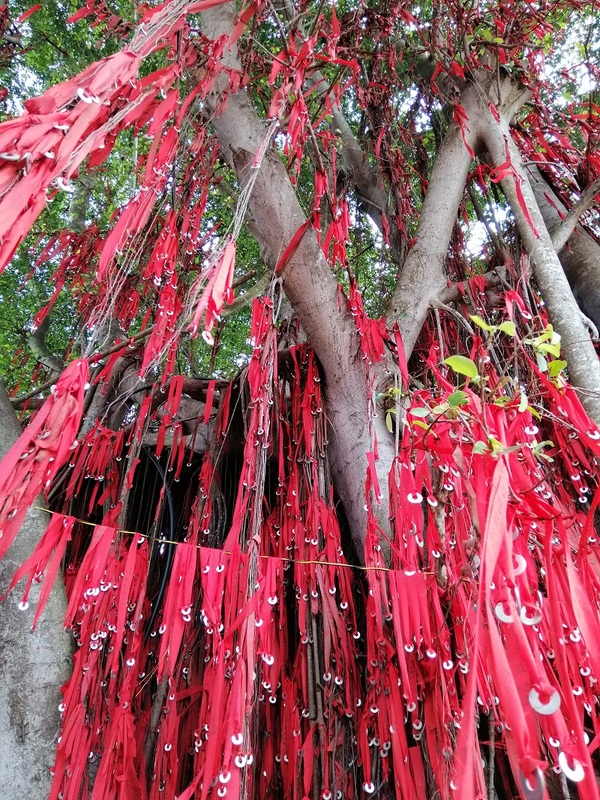 This is better known as Ma Yau (馬鮫) or Senangin locally. 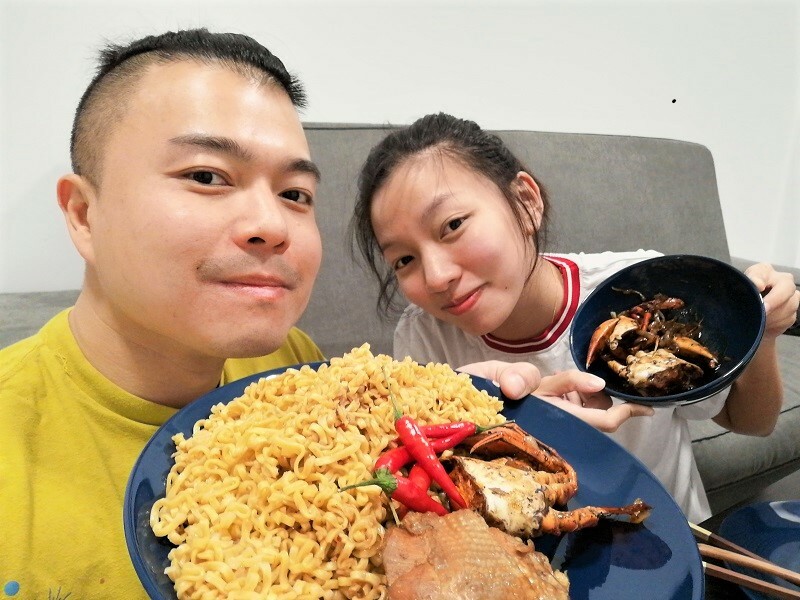 This is pretty decent and the fish is pretty fresh but for that price, I’ll rather eat the Estuary Grouper Fish Noodles at Min Yee or fork out an additional RM 4 for Ah Po’s top of the line Estuary Garoupa. 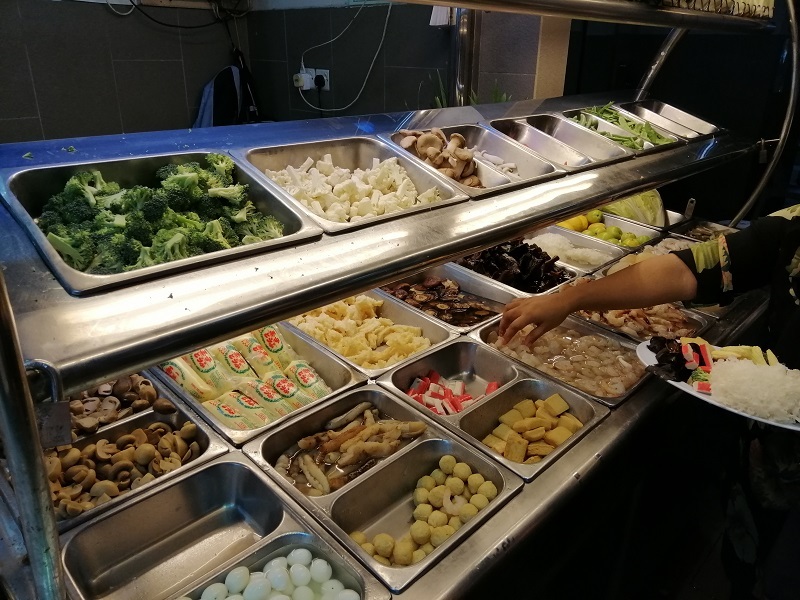 They also have Red Grouper Fish Noodles at RM 18 but it seems to be permanently sold out and the owner and owner’s daughter has confirmed this on numerous occasions (something to do with Chinese New Year and demand for the fish). 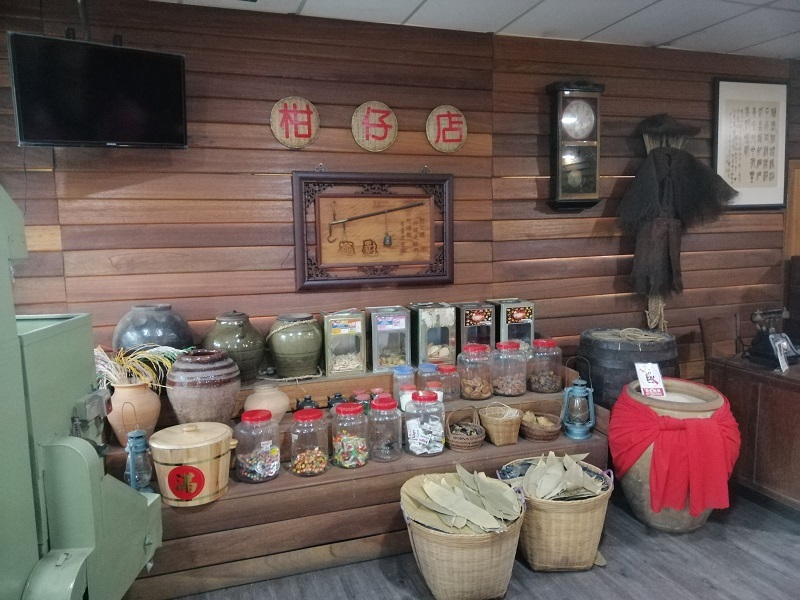 I would personally suggest coming here for their awesome RM 22 Estuary Grouper (Malabar Grouper/Greasy Grouper/龙趸) as they have the best cuts in town! 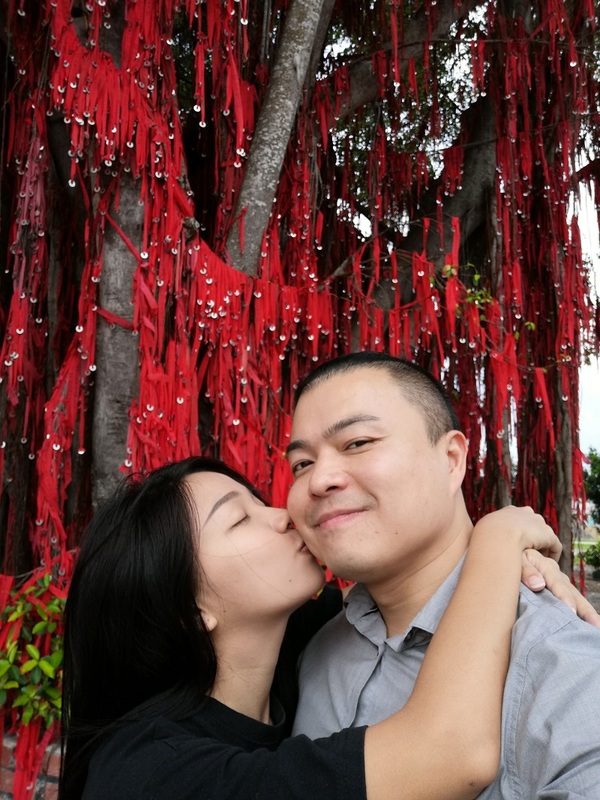 This is the first wedding we attended this year! I had missed a friend (and co-worker) wedding in December 2014 due to prior commitments, so this is the first wedding of 2015. 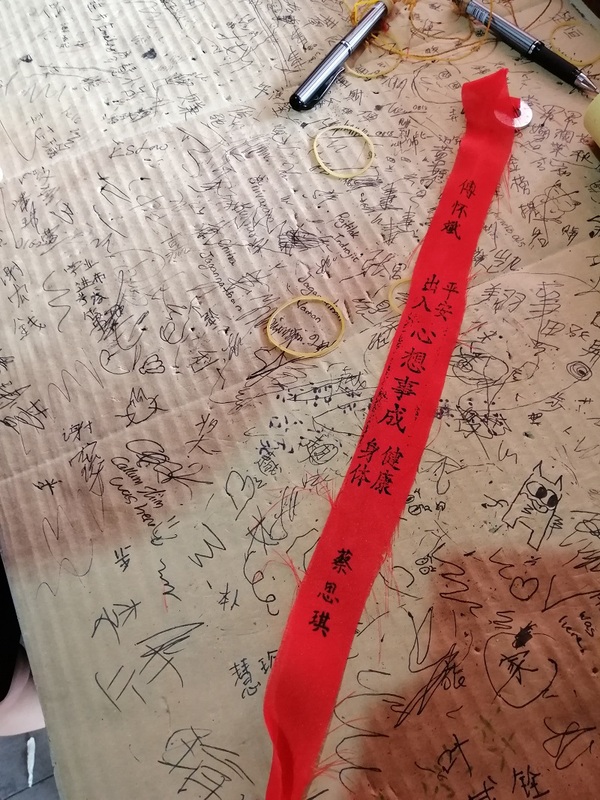 It’s a bit unusual as the traditional Chinese wedding banquet dinner was held on a Sunday night and the restaurant was quite far in Putrajaya Marriott Hotel so we got home quite late yesterday. The bride and groom had a ceremony earlier in the day which culminated in this wedding dinner. 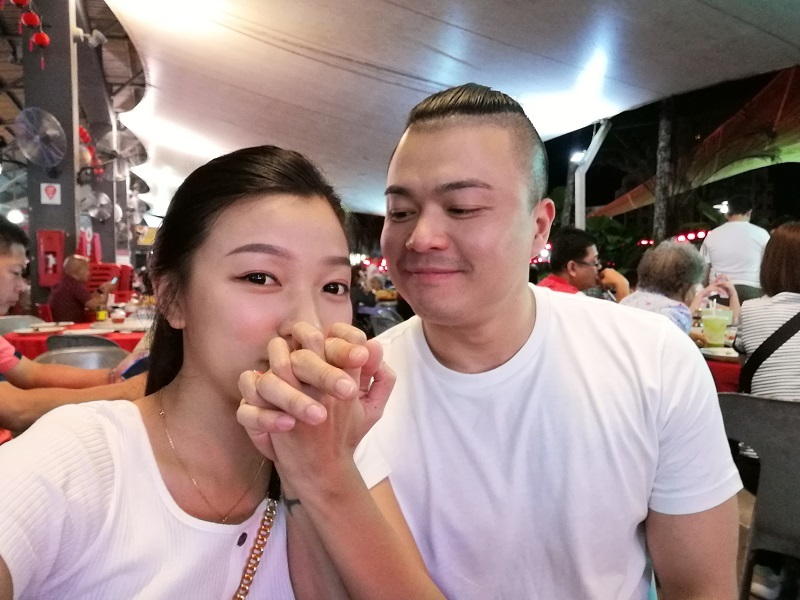 I knew the couple from a previous trip to Bangkok and the 9-course banquet was held at Summer Palace – the Chinese restaurant at Marriott in Putrajaya. 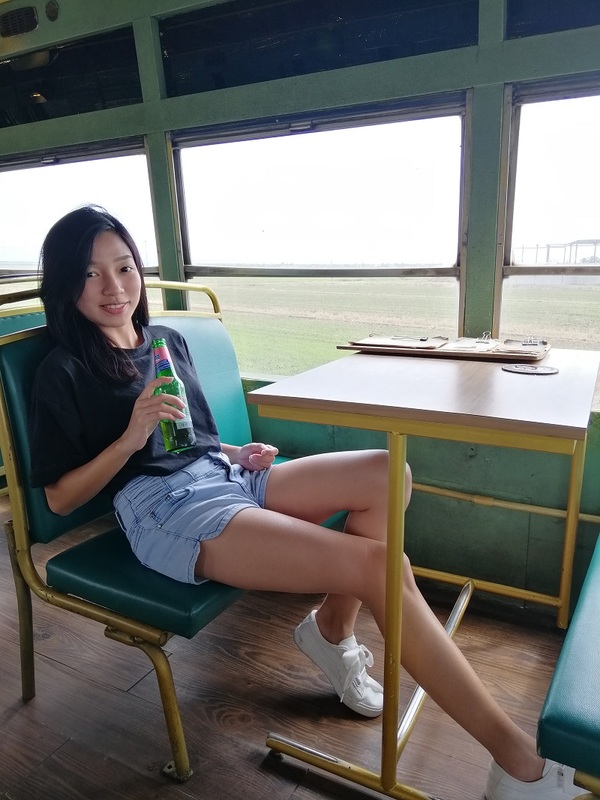 It’s a very nice place for a wedding – I’ve eaten here before at a company dinner and the food wasn’t too bad but the scenery and service is the main selling points. The servers are very conscientious about changing your plates after every course and I had a glass of The Macallan 12 year old for my drink. 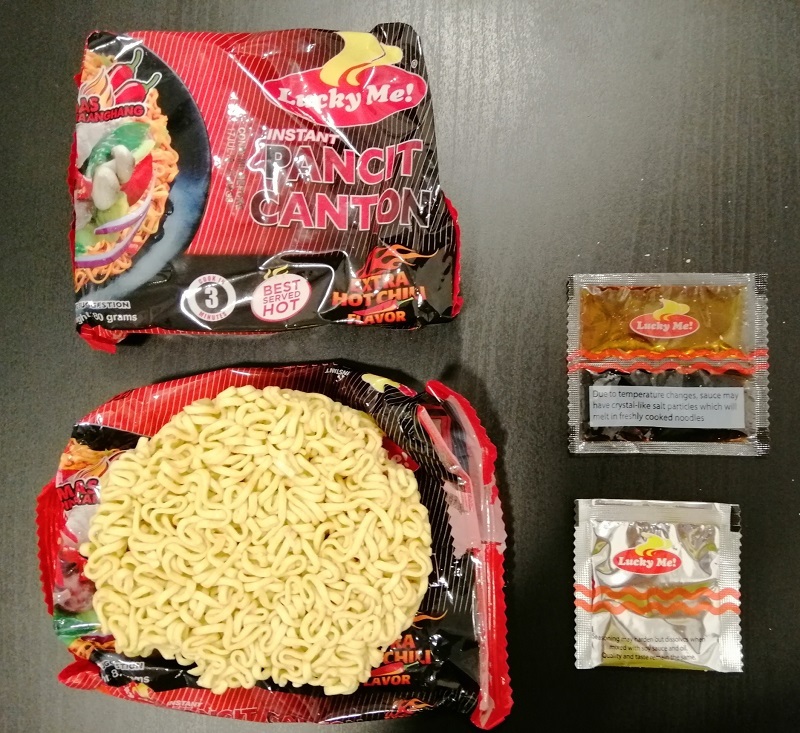 This is the first course and instead of the traditional “Four Seasons” plate with four food items this has five different hot and cold elements. 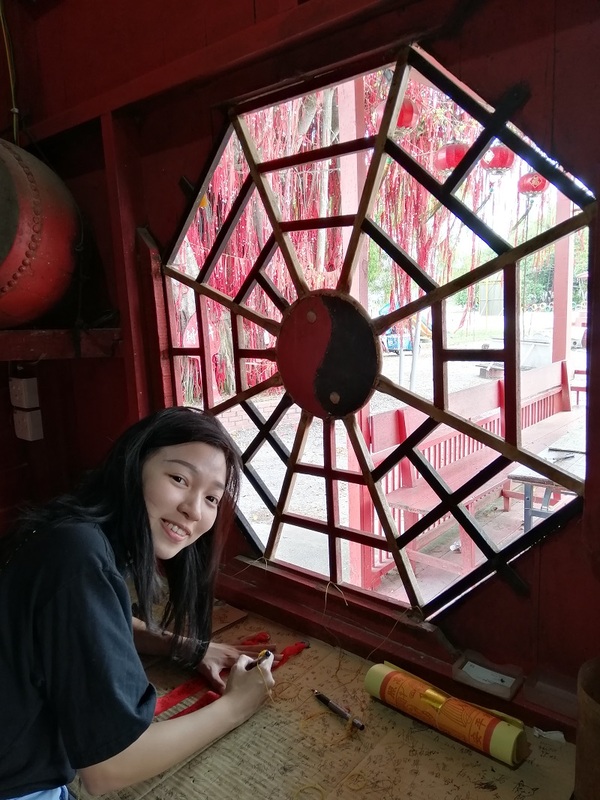 There’s also the increasingly common theatre that goes with the first course, with the servers getting in line and doing a performance before grandly putting the first plate on your table. 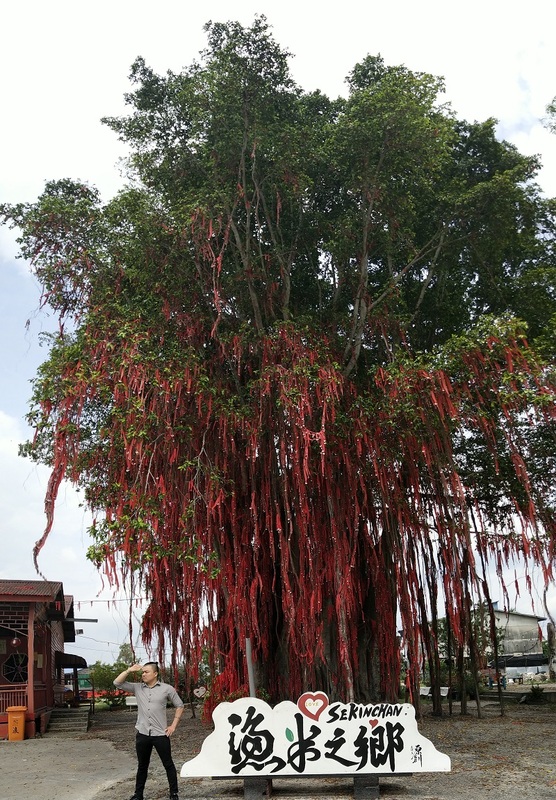 I first saw this at my sister’s wedding in Sibu but it wasn’t present at her wedding in KL. 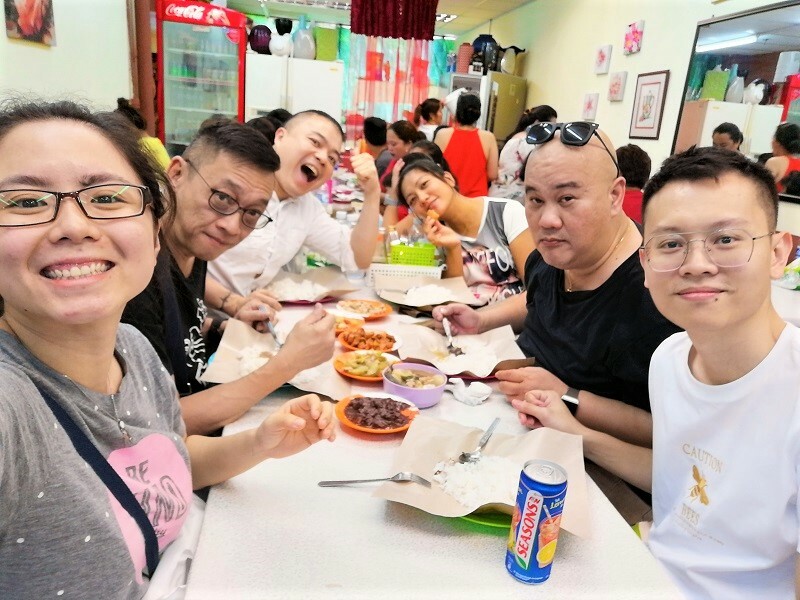 We thought the cold pork belly/duck breast slices were the best part of the dish – it was lying on a bed of pickled jellyfish which provided a wonderful acidic element. 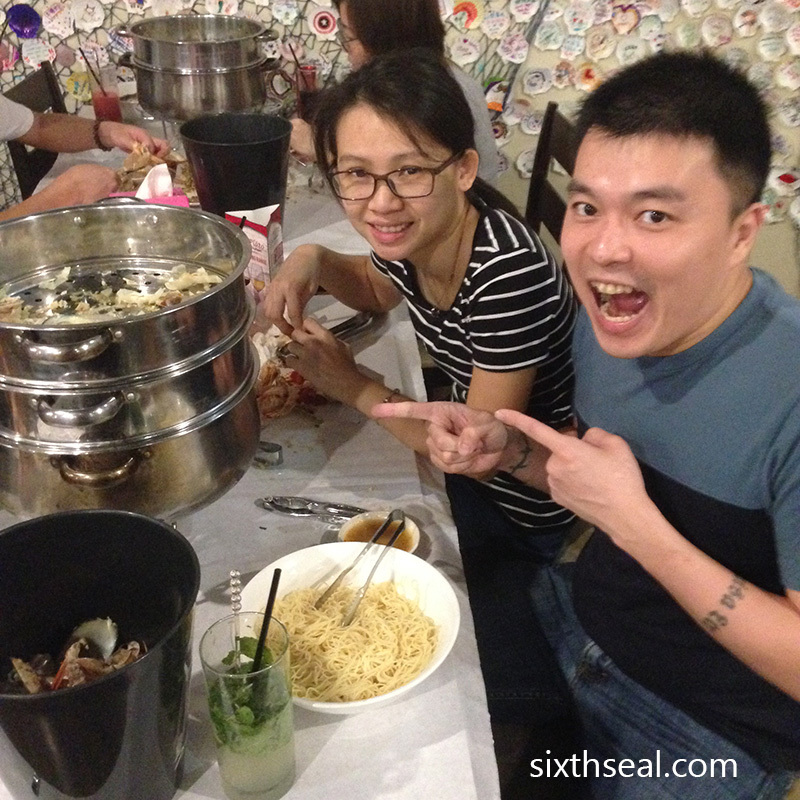 We also loved the boiled and deep fried salted egg. 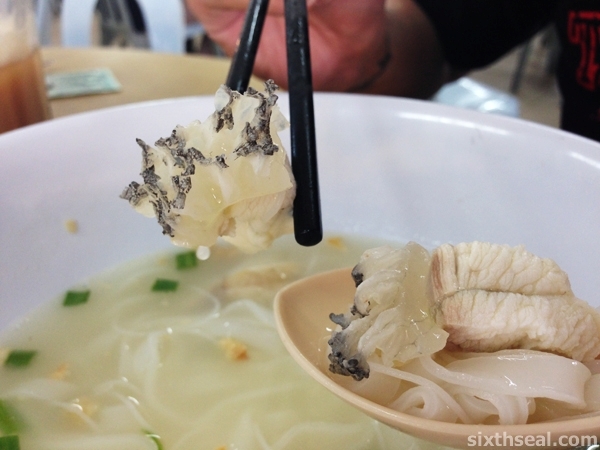 Shark’s Fin Soup has gone out of vogue since the environmentalist types and the wannabes/sheep started a crusade against it. I’m personally ambivalent about the issue, as most people who really understand the issue, with the entire hypocrisy (and racism) of Sea Shepard and other militant environmental organizations on one side and the heritage of Icelandic culture (hákarl – fermented Greenland shark), Canadian legal seal meat and Japanese/French proudly unapologetic cuisine on the other. 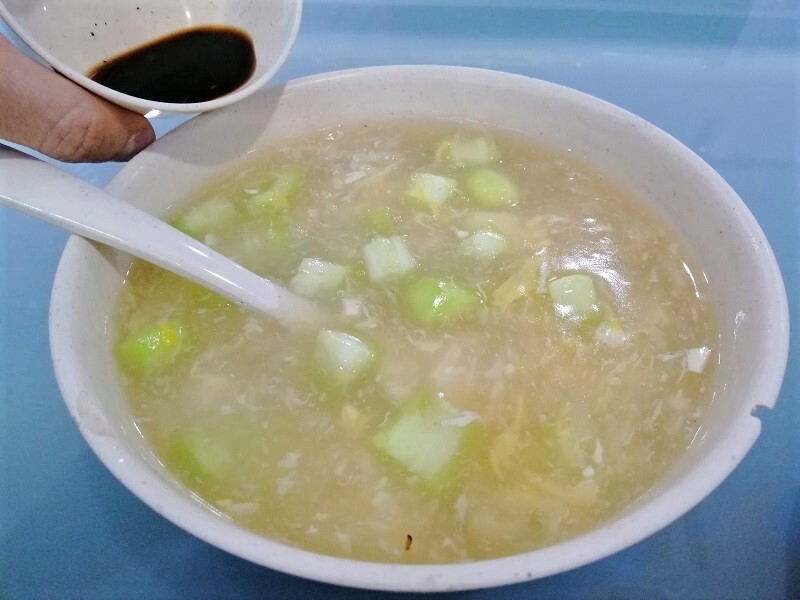 However, I think the substitution of shark’s fin soup with a clear soup with premium ingredients like abalone, fish maw, top shell (magpie shell) and such is a good thing too and it tastes better and there was been a spate of fake shark’s fin going around in the few years before it became the “S-word”. 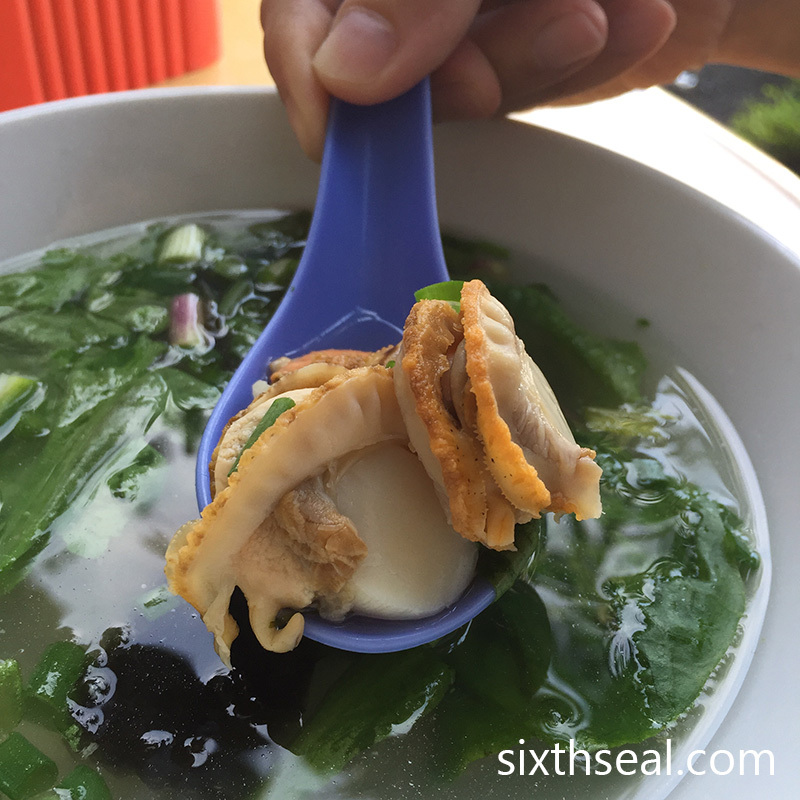 This is a good example of a nice clear soup which highlights the abalone, top shell, chicken and fish maw and it’s individually portioned beforehand. The chicken done two ways is a nice twist on the traditional roasted chicken. However, I’m not a huge fan of chicken done this way – there’s no sea salt or plum sauce for the slightly overcooked and dry roasted chicken and the roasted sesame chicken wasn’t much better. 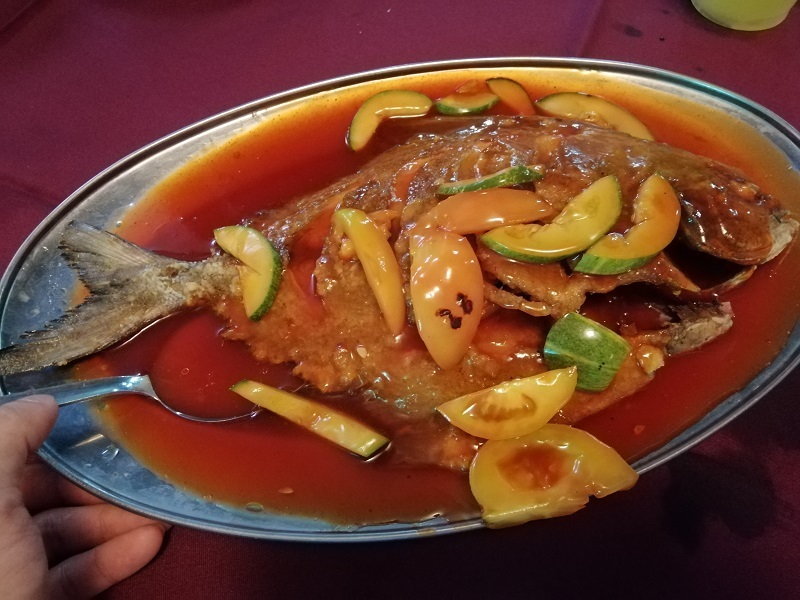 This seems to be the latest trend in serving fish at Chinese banquets! 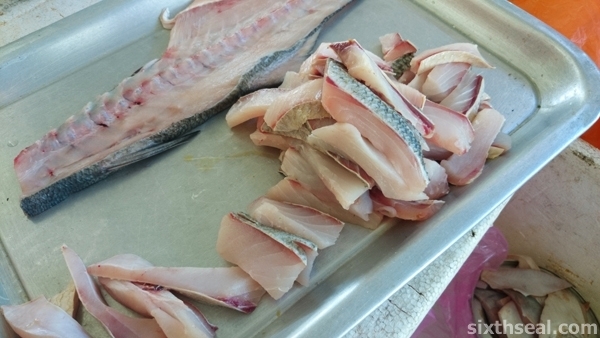 The fish is totally de-boned and filleted. 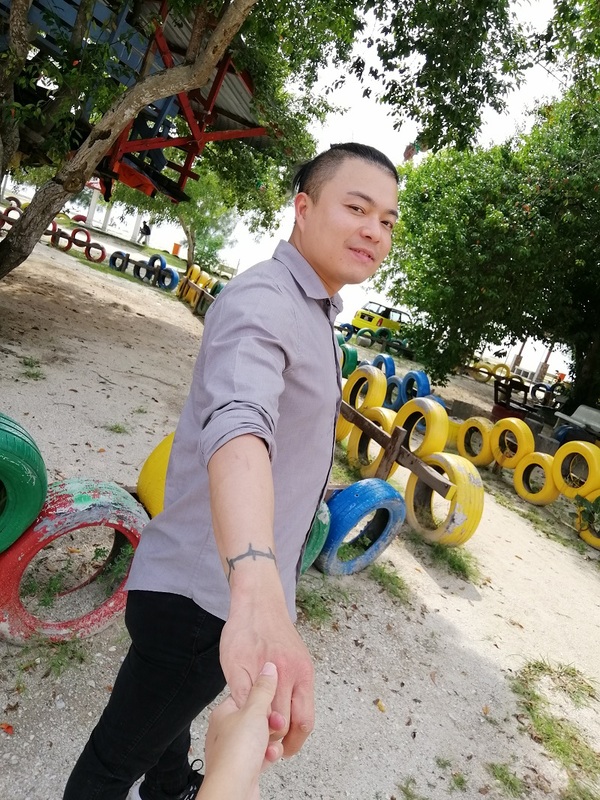 The fillets of fish is then wrapped around a long, tubular “fish ball” and presented on the carcass of the fish so it looks like rolled up fish flesh. 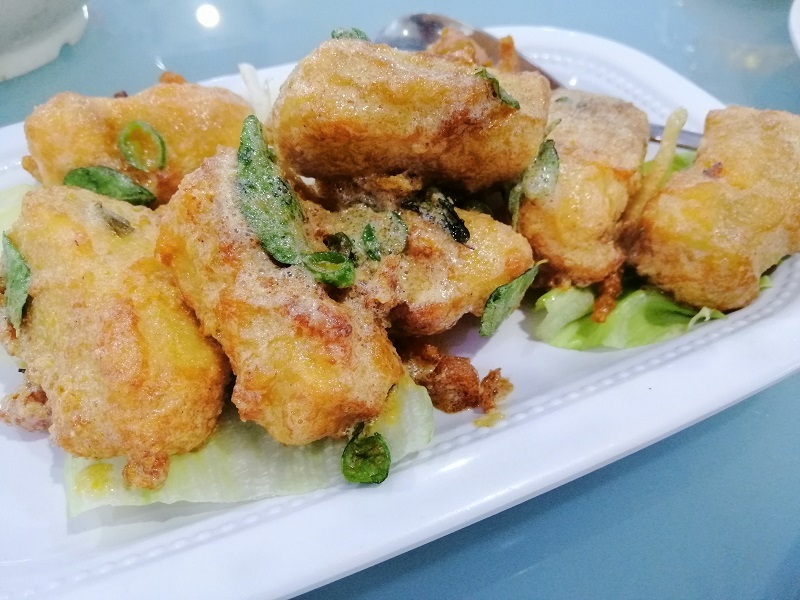 I’m a purist so I still prefer steamed fish served whole but I have to admit, this “unicorn style” platters of fish is very easy to eat, and the fish ball inside makes it taste artificially good with lots of MSG! This is the best dish that we had the entire night! There’s huge prawns done two ways, and they’re all de-shelled and de-veined. One is cooked in a sweet and wet butter/mayo sauce and the other is deep fried in butter. 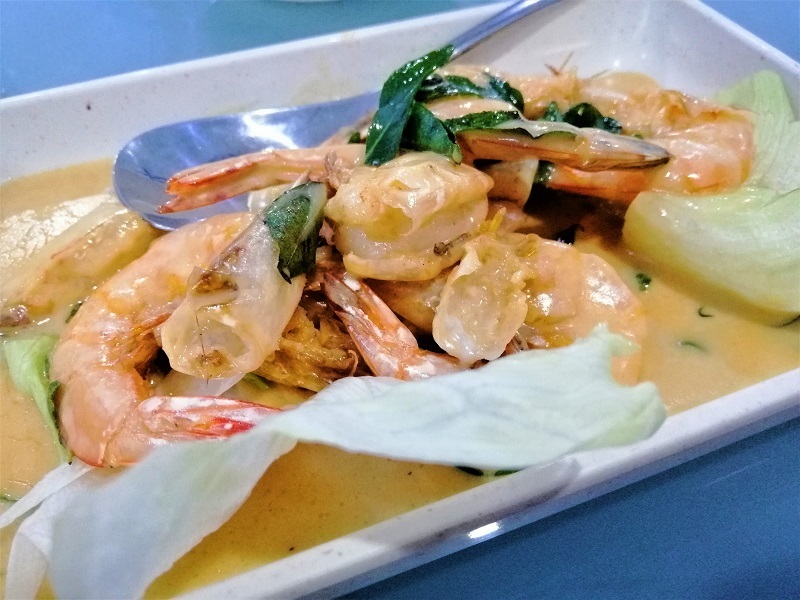 It’s very creamy and I love the huge, juicy prawns – I had three and my better half had two. 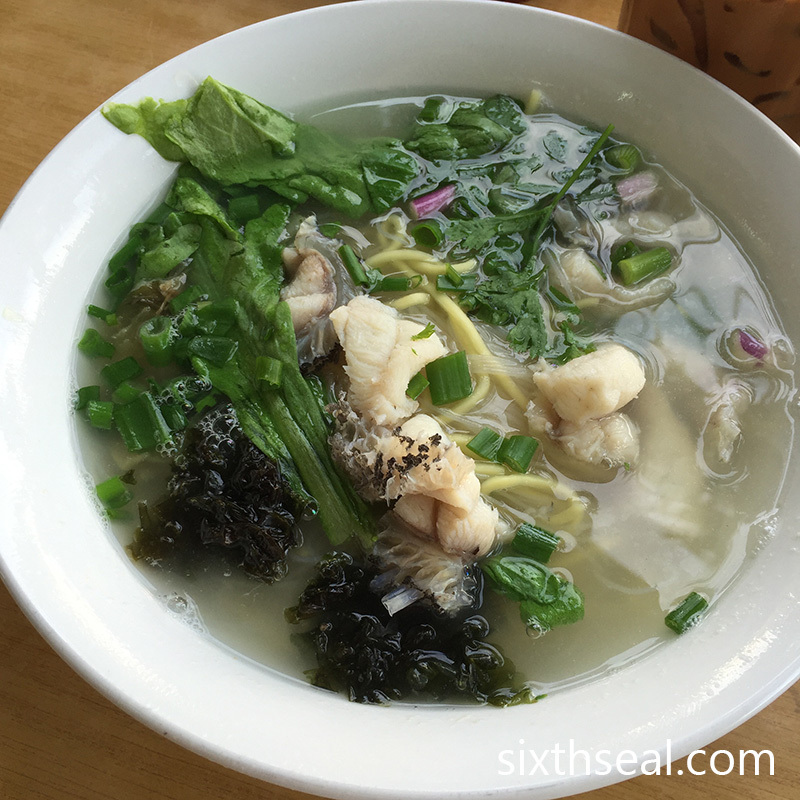 I love the texture of sea cucumber! I’ll actually order this if I see it around. 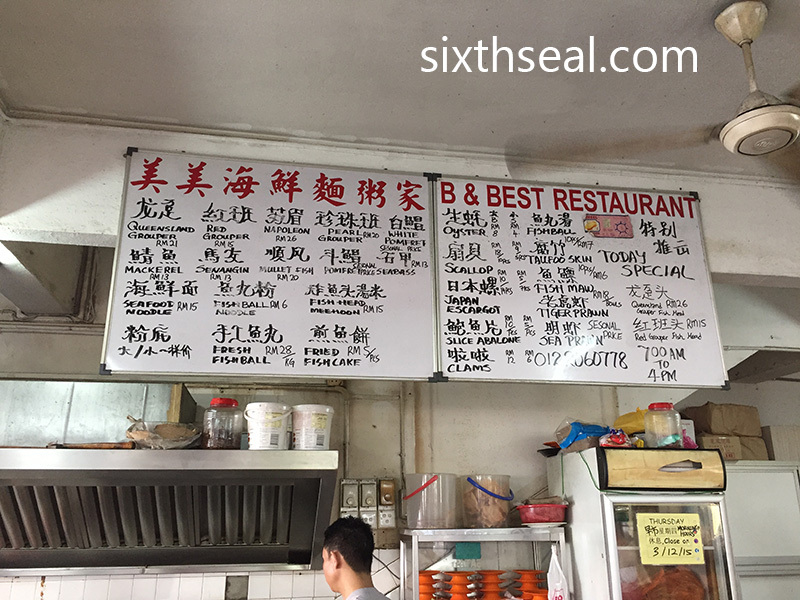 There was a RM 60 PNG (Papua New Guinea) sea cucumber promotion at Glory Cafe in Sarikei when we went but I was too full to order it. 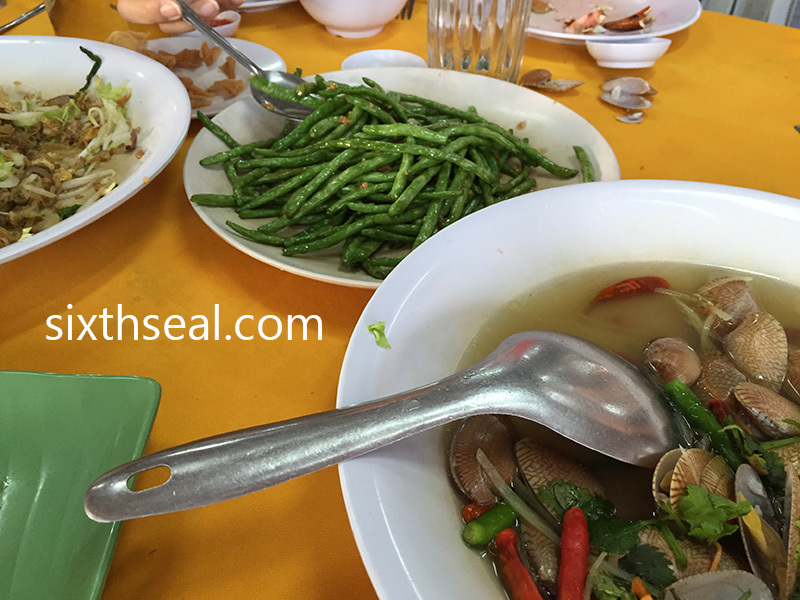 The sea cucumber here is done well, thickly sliced and full of slippery and chewy collagen. I also liked the mushrooms – very flavorful, especially with the bits of dried and rehydrated scallops in the reduced sauce. There’s nothing special about this dish – it’s just rice done three ways. There’s plain fried rice on top, rice fried with light soy sauce in the middle and cooking caramel (dark soy sauce) fried rice at the bottom. 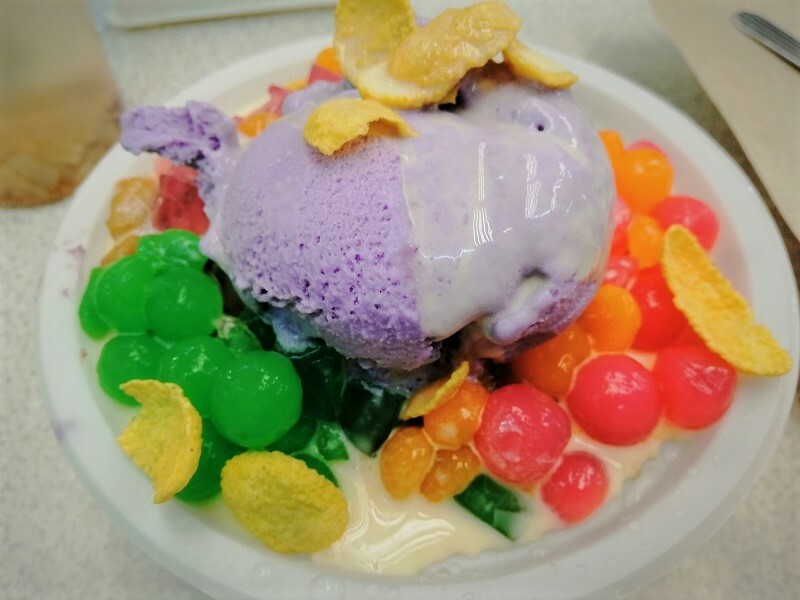 That’s what causes the layered coloration and it was very oily – this is a dish for people who’re still hungry to fill up before dessert is served. I know people who eat this way – main dishes only (fish, chicken, pork etc) with no accompanying rice in a multiple course banquet where they fill up on fried noodles or rice as the last course, it’s a different style of eating but we were too full at this point to eat more than a spoonful of the rice to taste it. This is actually pretty decent! 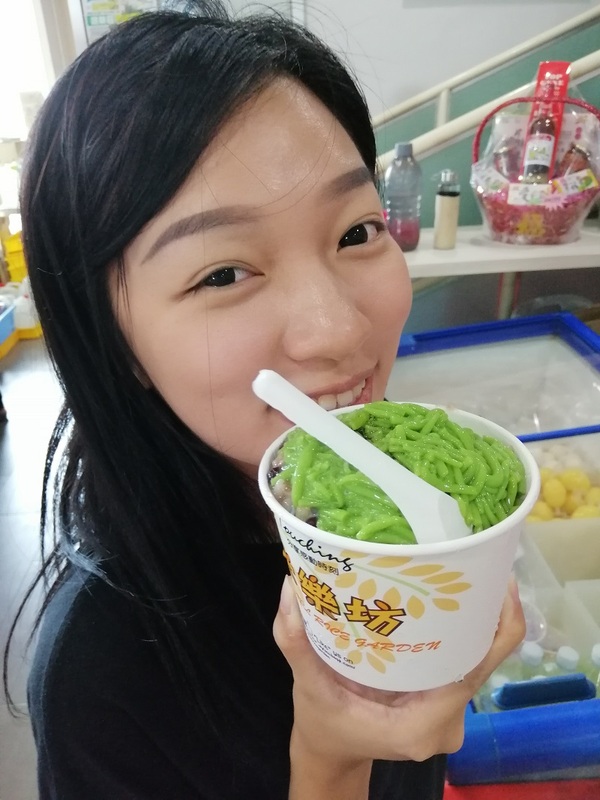 They made the crushed peanut covered mochi to be flavorless (except for the smoky and nutty accents from the peanuts) so the sweet component comes from the mung bean shaped and moulded into a cartoonish ear of corn. It’s meant to be eaten together and it’s a good pairing. The Chinese characters makes a lot more sense than the English translation though. Haha. This is the highlight of the dish and it was what we had saved up space for. We both thought an avocado based dessert sounded delicious and we’re glad we waited for this even though a lot of people were leaving at this point to beat the traffic and try to get home before a work day. It has a wonderfully rich mouthfeel and a nutty flavor that’s very morish. Delectable!